Couldn’t agreement more with your conclusion on Jakarta. Spent 2 nights to adjust after arriving from Europe around midnight, but saw everything in 3 hours. 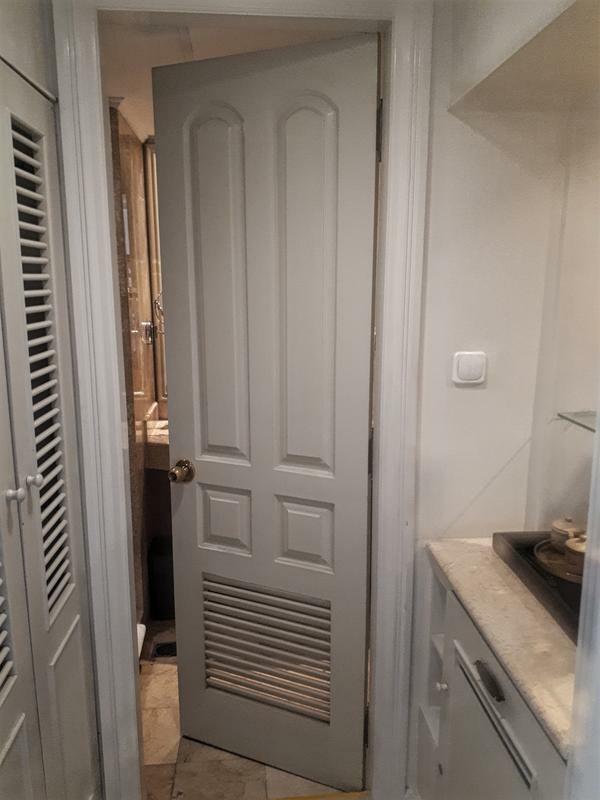 I agree - if it weren't for the excellent Hermitage hotel that would for sure be my decision. After breakfast in the morning at the hotel I was off with a taxi to the airport. 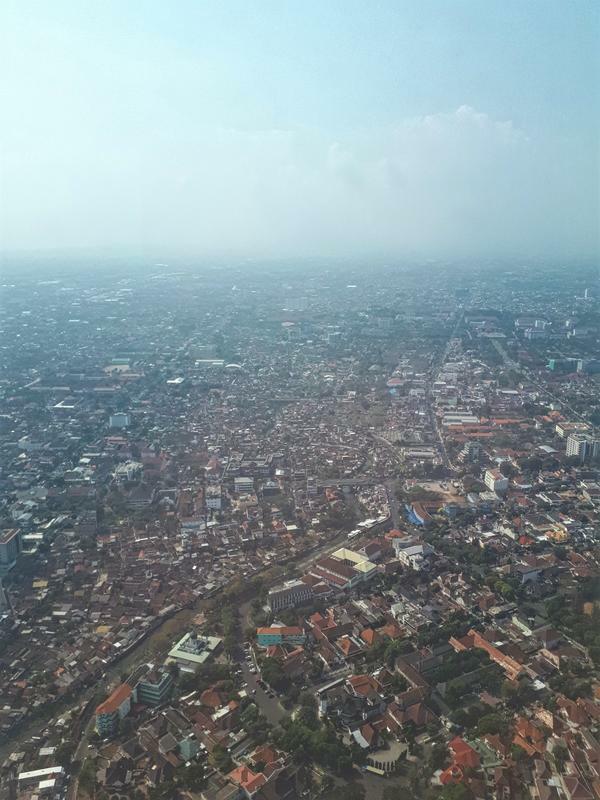 It being a Monday morning, I left very early knowing the horror tales of Jakarta traffic. And indeed - traffic was quite bad and it took almost one-and-a-half hour to two hours to reach the airport. 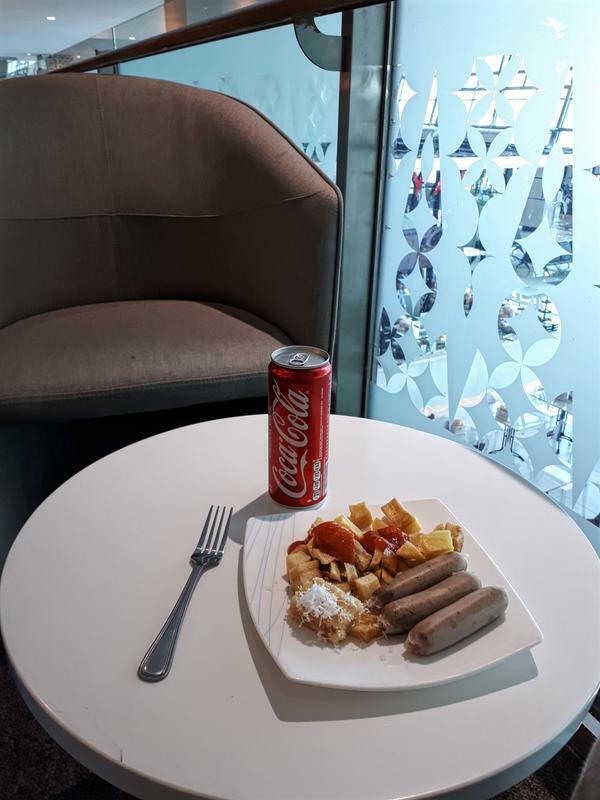 I however managed to arrive around two hours before my flight, which was all I wanted as I wanted to check out and review the lounge! 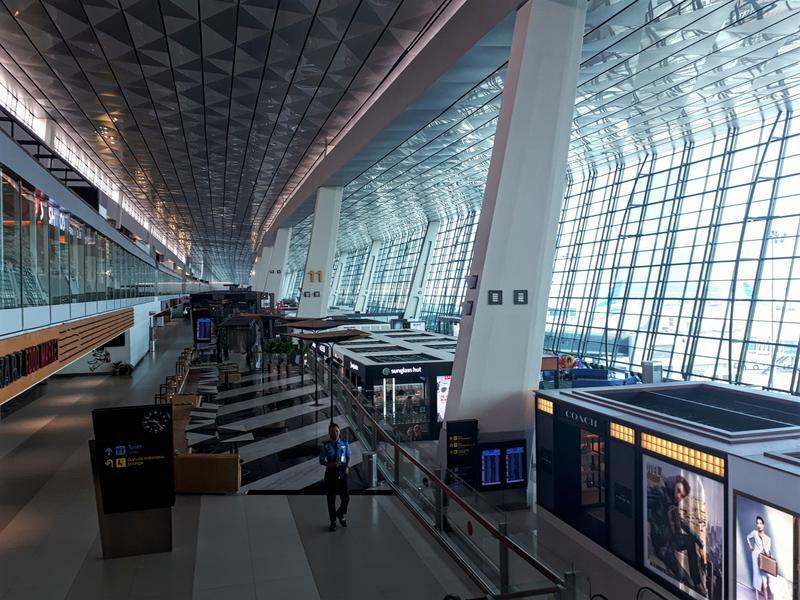 All of Garuda Indonesia's flight operate out of terminal three, as well as a selection of other international airlines. 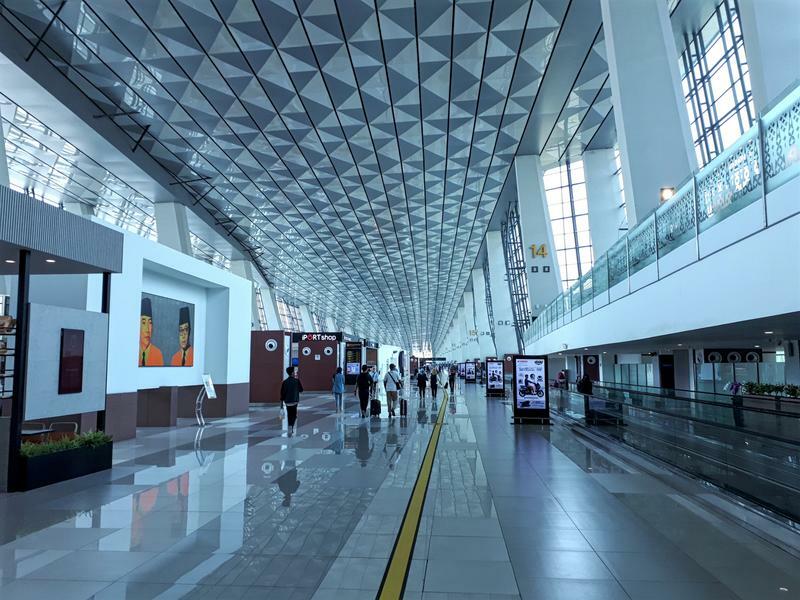 The terminal is quite new, being opened in 2016 – and it does still look very fresh and new. Even better: it felt so empty that walking around was such a breeze. I easily managed to print my boarding pass from one of the computers in the check-in area. There was no queue whatsoever at security and I was landside at the domestic terminal after a short walk. 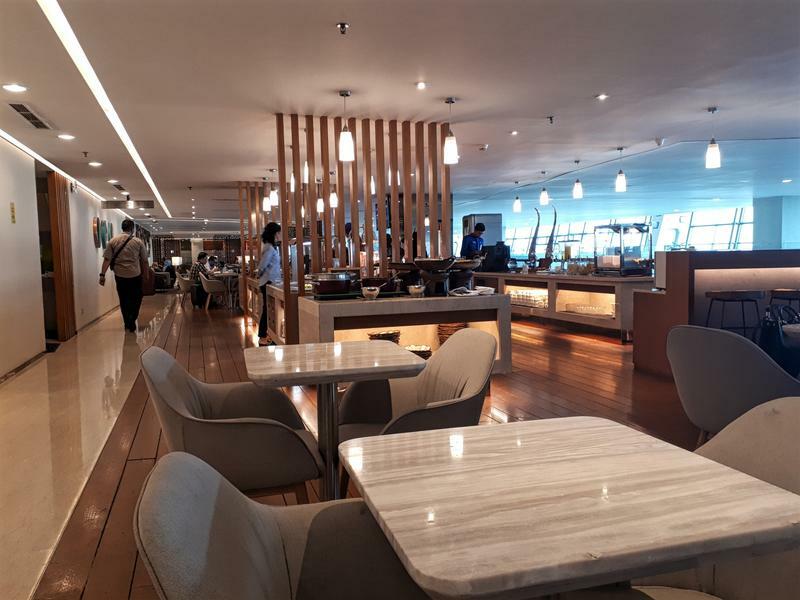 The Garuda domestic lounge is just a short walk from the moment you enter the terminal landside. A friendly lounge dragon had a quick look at my boarding pass and welcomed me in. 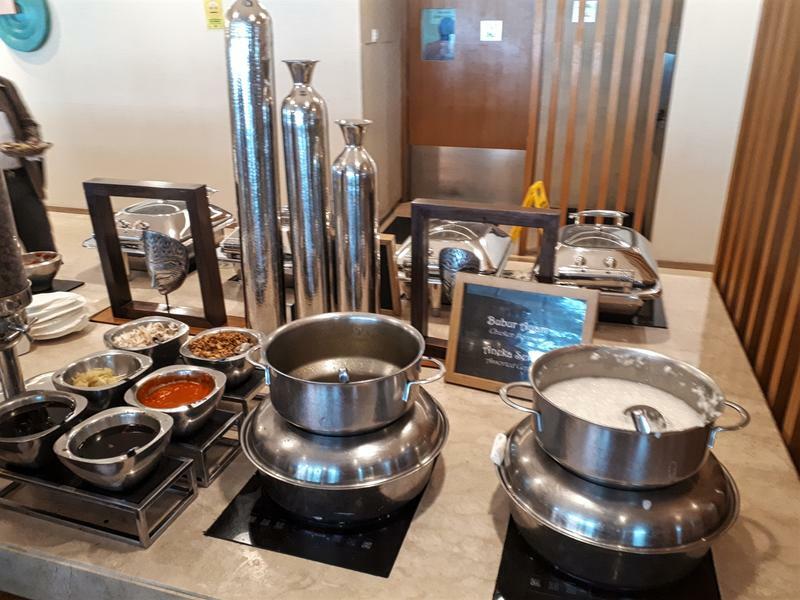 First impressions of the lounge were not bad. 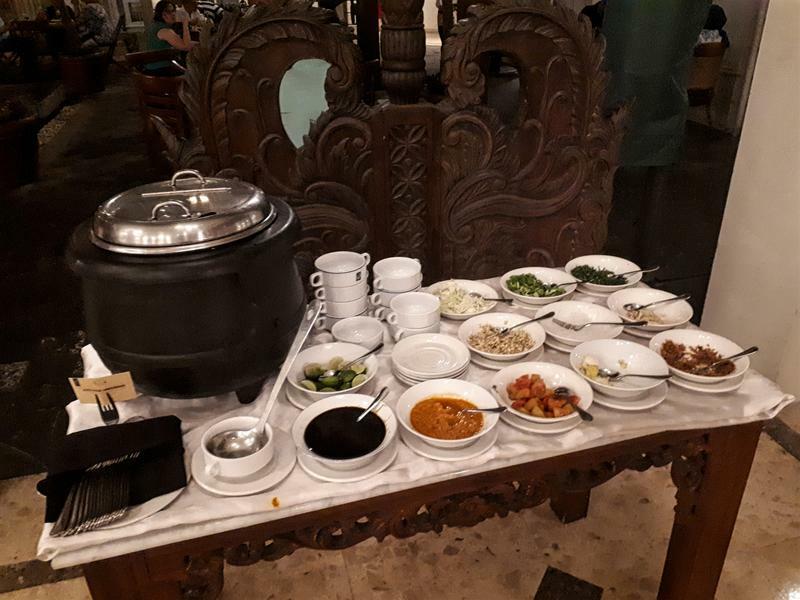 Even though it was fairly crowded there were plenty of comfortable seats available, as well as some dining tables for those wanting to get something from the buffet. 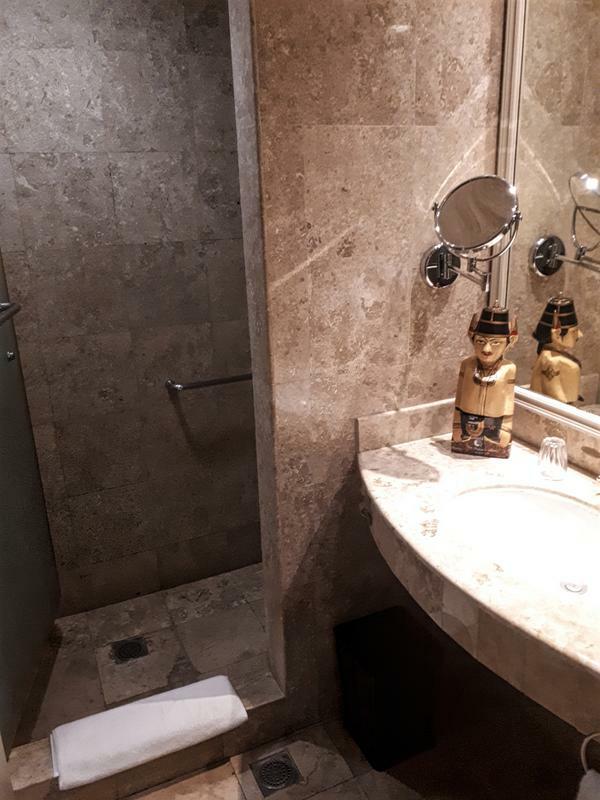 Plenty of (clean) toilets were there too. There are however no views of the tarmac, instead you look out over the terminal from one side of the lounge. 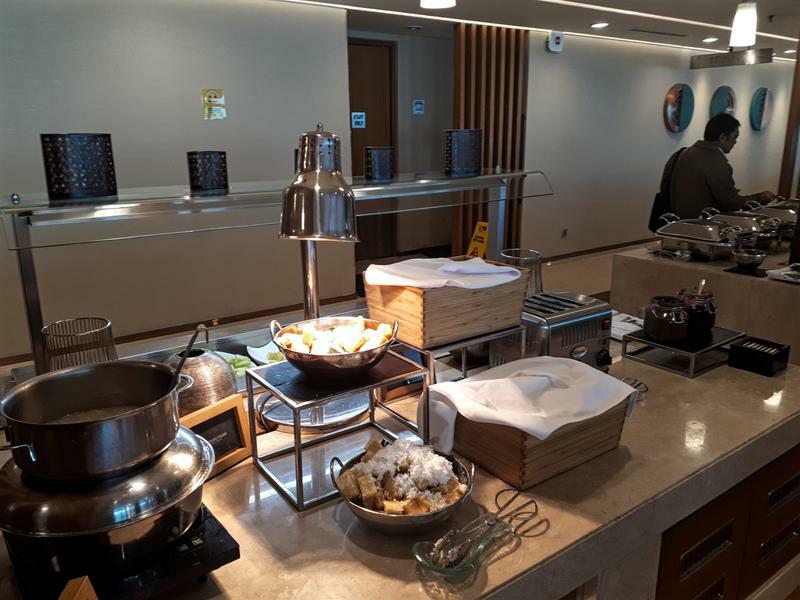 The buffet was huge and was quite impressive for a domestic lounge! 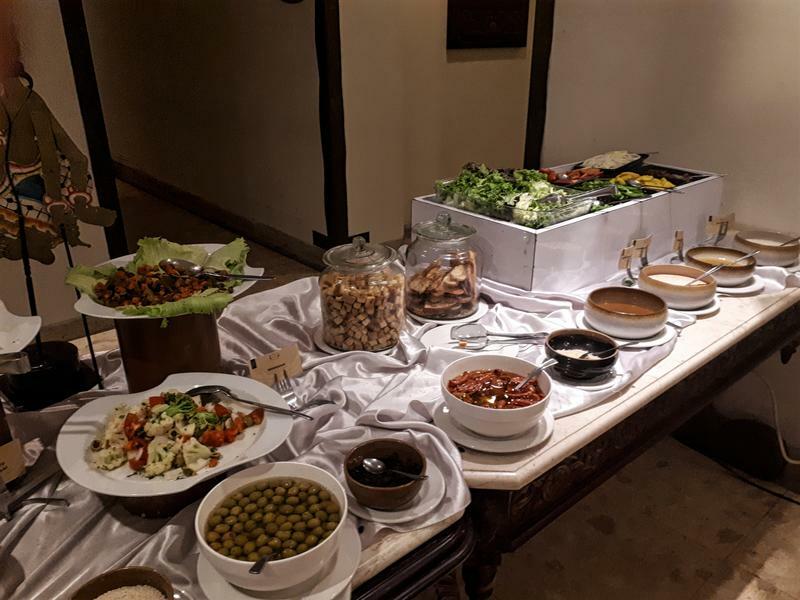 At arrival, the breakfast selection was still out – but throughout the stay in the lounge some dishes were replaced with the lunch selection. 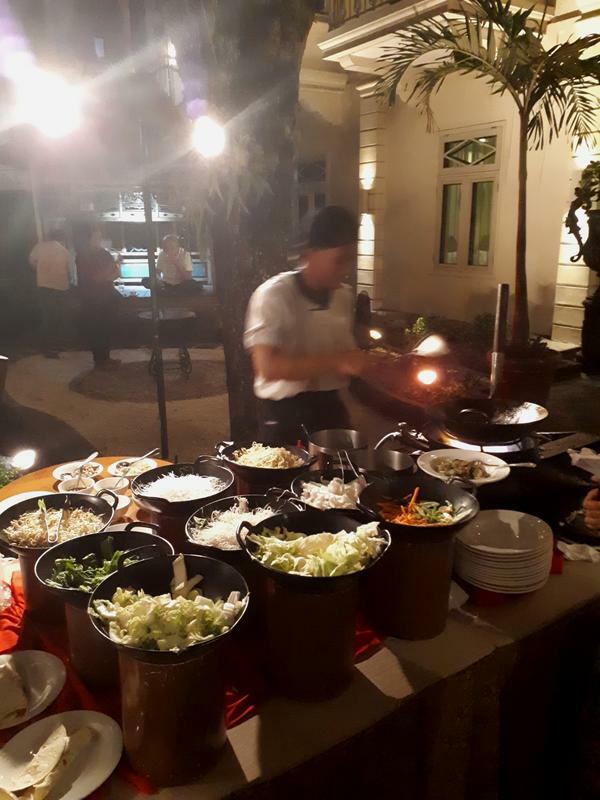 Most of the spread was obviously Indonesian – with only a limited amount of food international. There were plenty of soft drinks and coffee machines available, but no alcohol. 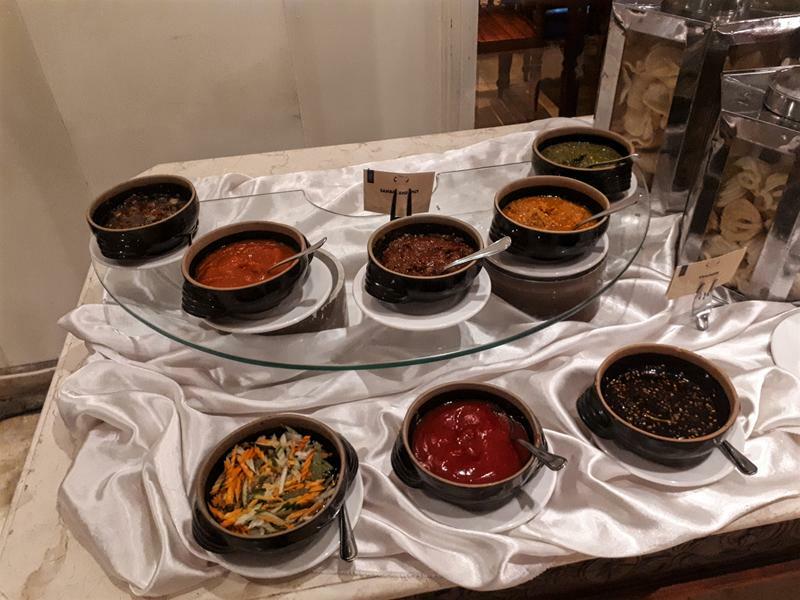 For review purposes, I tasted both a bit of the Western options as well as the Indonesian options. The Western breakfast food was... ugh, not so good! 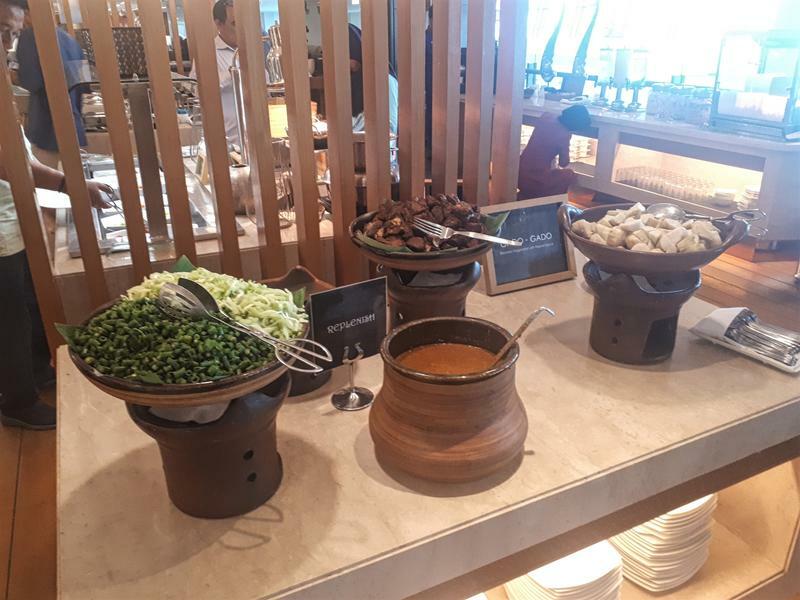 It tasted like it was already out for three days straight in the buffet (even though it was probably not as food was constantly refreshed from the kitchen). 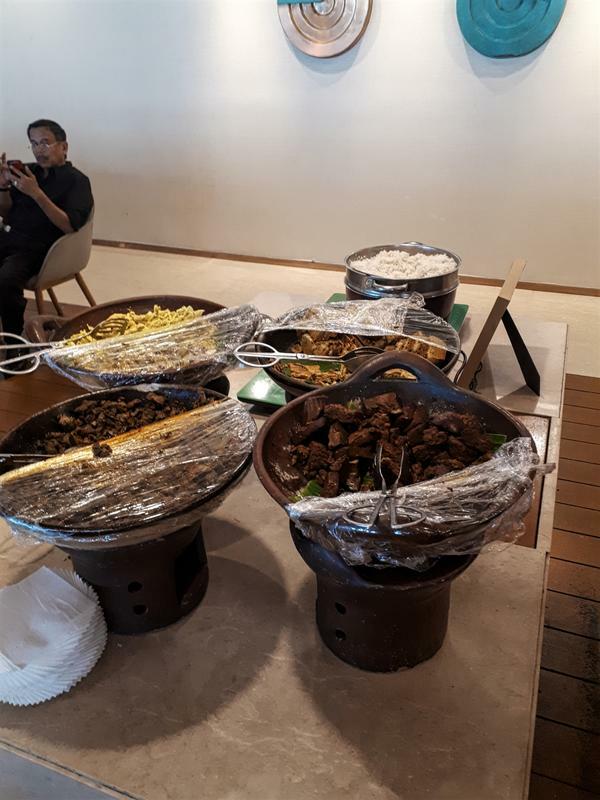 The Indonesian food however was very good – and just seeing how much the predominently Indonesian flyers were enjoying the food, it seemed like even a good substitute for a hotel breakfast. After my time in the lounge it was time to head to my boarding gate. But boy, it turned out to be a long, long walk! 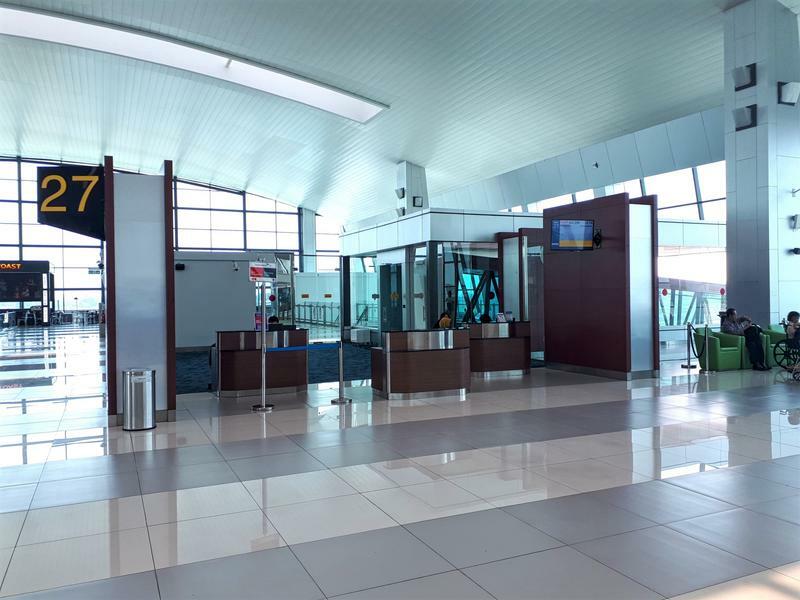 The terminal is shaped in a kind off L shape, and my gate was at the outernmost point on the right-bottom cornor of the foot of the L.
It seemed like an almost 20-30 minute walk from the lounge to the furthermost gates. During my walk I constantly saw golf carts passing by driving people to their gates. 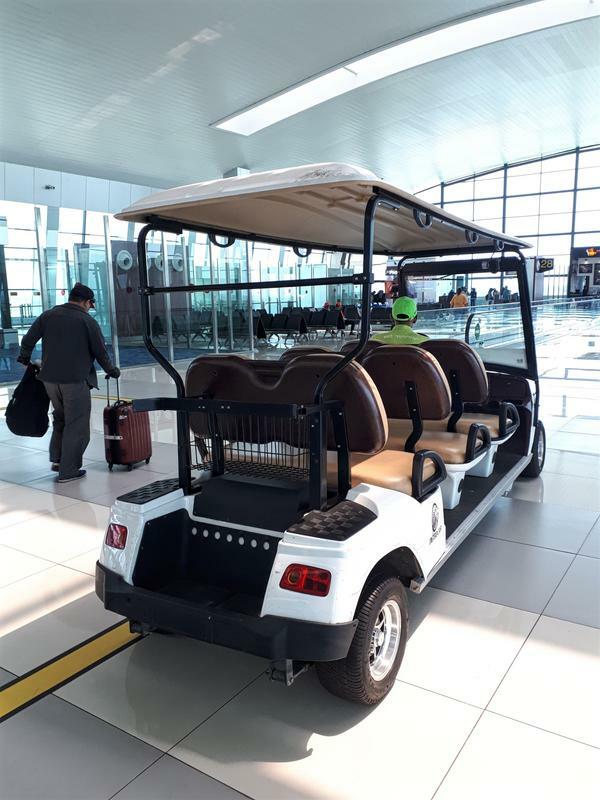 It seemed that the airport has a free service driving people to their gates as during the walk I also spotted several waiting areas where you could queue for a ride! 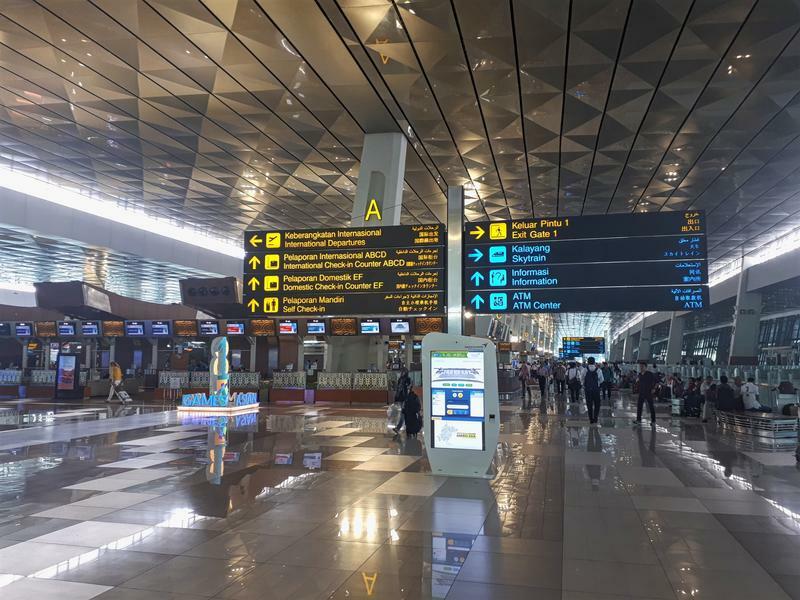 When I finally arrived, the gate agents almost immediately announced a 20 minute delay. So I hang a bit around the gate area a bit more waiting for the flight to board. 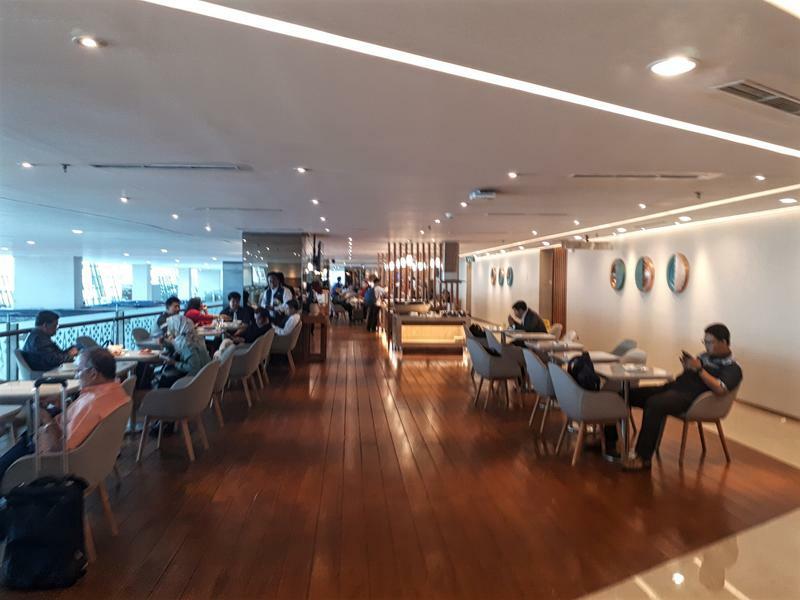 In short: Jakarta's Terminal 3 is a pleasant surprise, as was the domestic Garuda lounge. Sure, it is not groundbreaking with its seating comfort or extra amenities, and there is no booze. 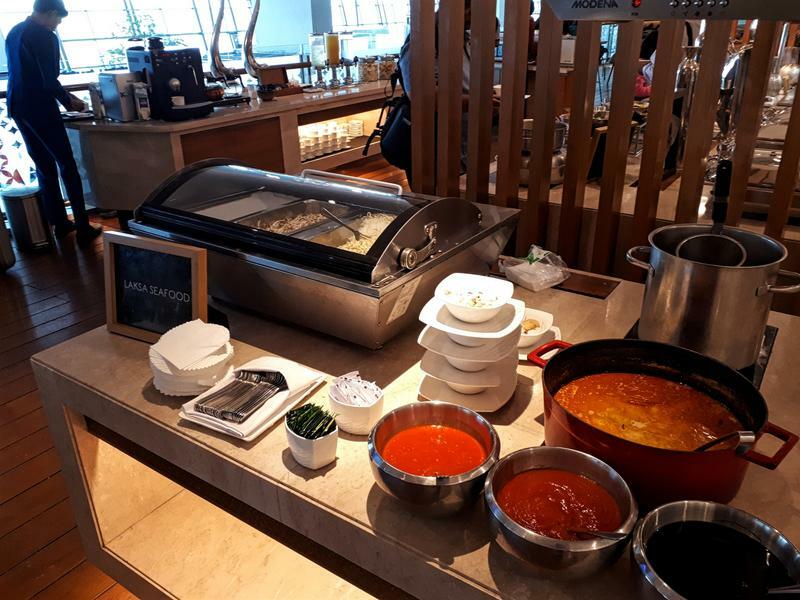 But for a domestic lounge it is a nice quiet place to wait for your flight with a huge fresh food spread. 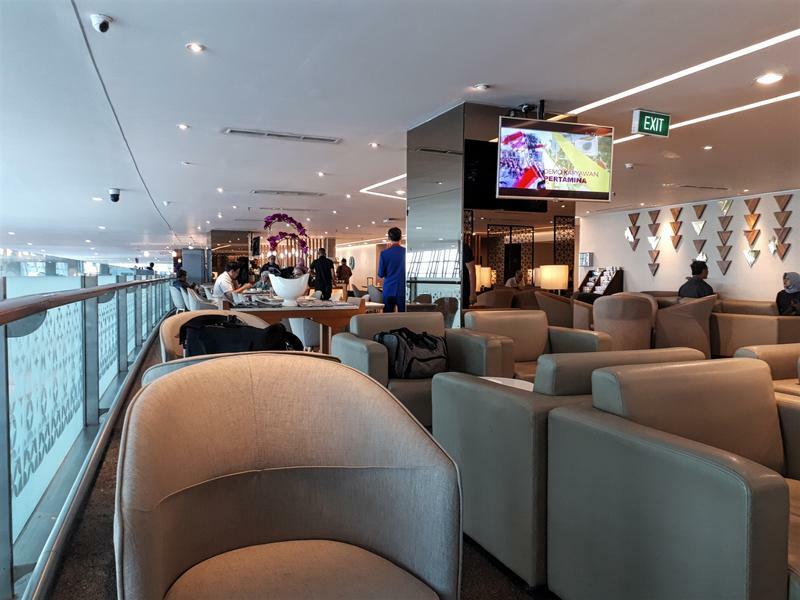 Only take care that some of the walks to the furthermost terminal gates can take some time, so make sure not to leave the lounge last-minute when final call is announced! 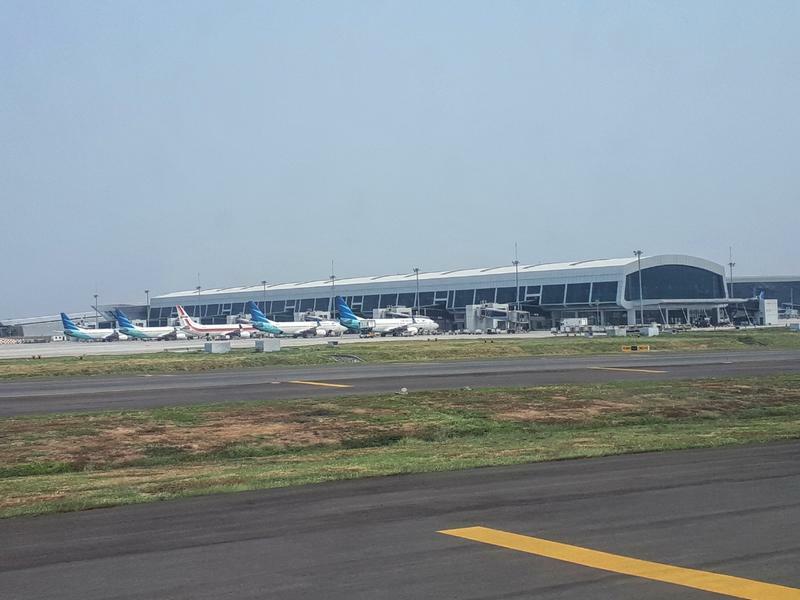 Next up: Flying with Garuda Indonesia from Jakarta to Yogyakarta in business class. 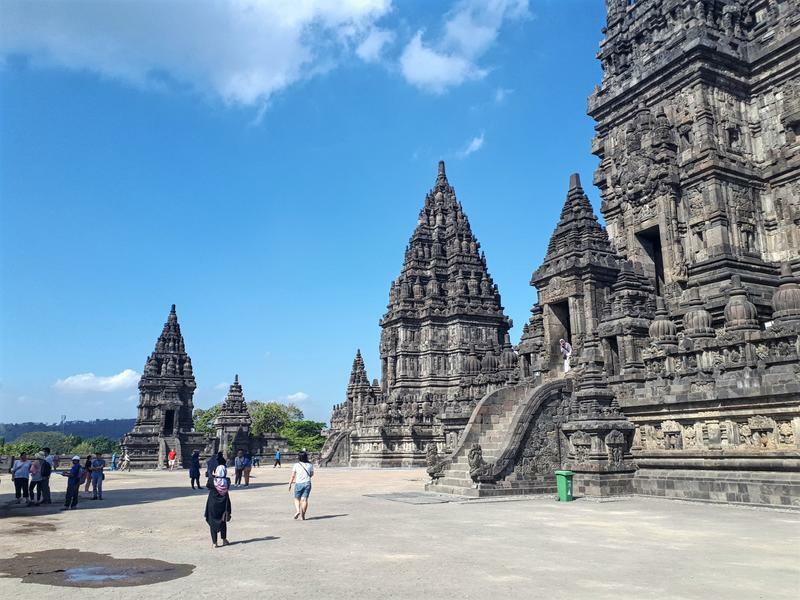 I was originally thinking to take the train between the Indonesian capital of Jakarta and Yogyakarta, considered to be Indonesia's cultural capital. I love trains, and you get so much more of a feel of the country from a train or your own rental car (I do usually try to avoid buses as honestly in such a case I'd almost rather cycle or walk). Before the trip commenced I however ran into some problems at work. I was granted the week provisionally off. Normally my boss is super relaxed when it comes to asking for days off and this would never be a problem at any other time in the year outside of July and August. Yet due to the summer holidays, some unexpected rostering problems and dozens of others being off (including my boss himself) I was the only person to fill in some gaps at the company. I knew beforehand there could be a small chance this would happen and I did plan around it in. Given the time difference it would mean I still could sightsee around in the morning, starting work mid-afternoon until late evening on the five weekdays during this trip (I can work remotely). That however kind of ruled out the train due to its late arrival hour. But fortunately flight tickets were cheap even booked a few weeks out in advance. With business class only being 40 or 50 EUR or so more than economy, it was a no-brainer to book into the premium cabin, if only for the bit of extra miles, comfort and Flying Blue XP. 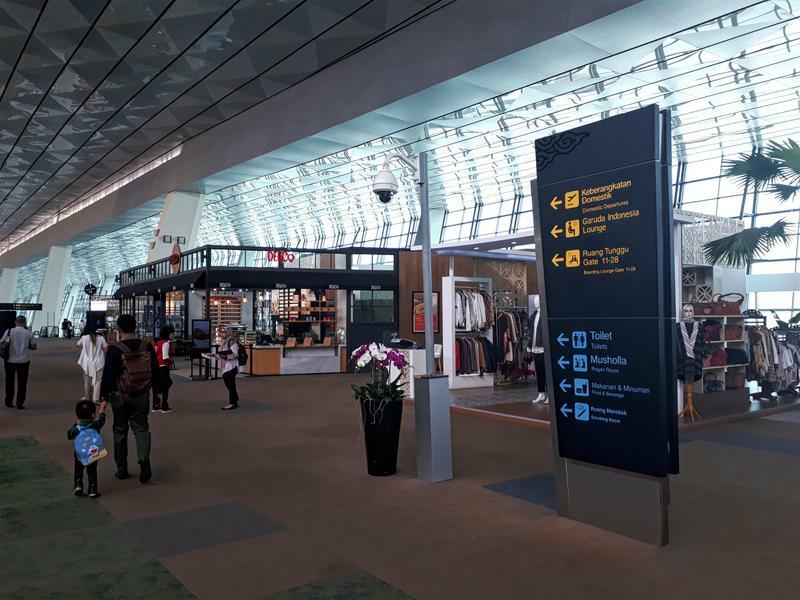 Boarding commenced half an hour later than expected – the gate agent already announced the flight would be delayed by this much time for unexplained reasons. 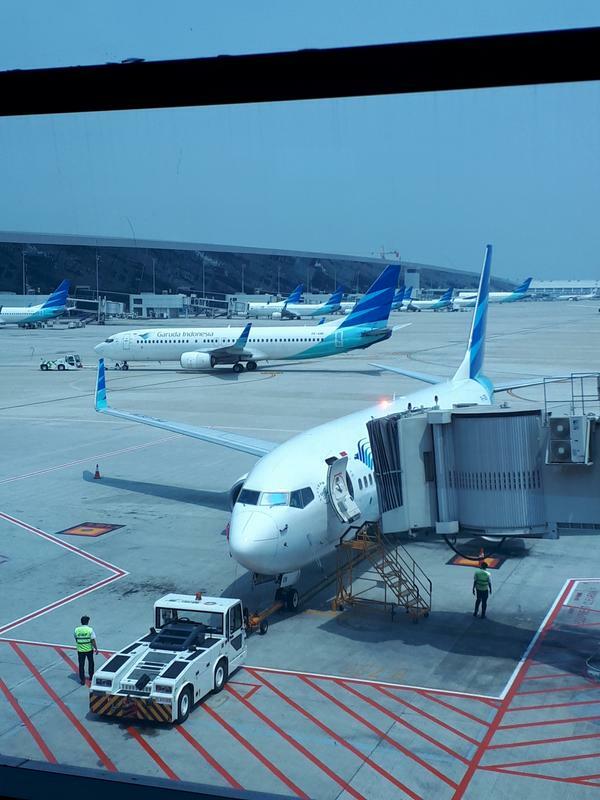 Priority boarding was strictly observed and I was the first to board the Boeing 737-800. 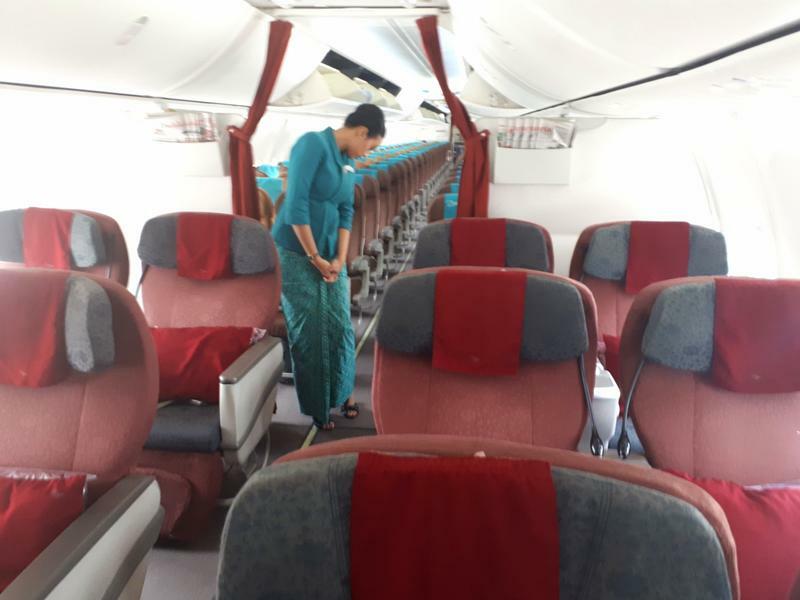 The flight attendants gave me a warm welcome upon stepping foot in the aeroplane – always a good sign for the service on the flight to come. First impressions of the cabin were good. 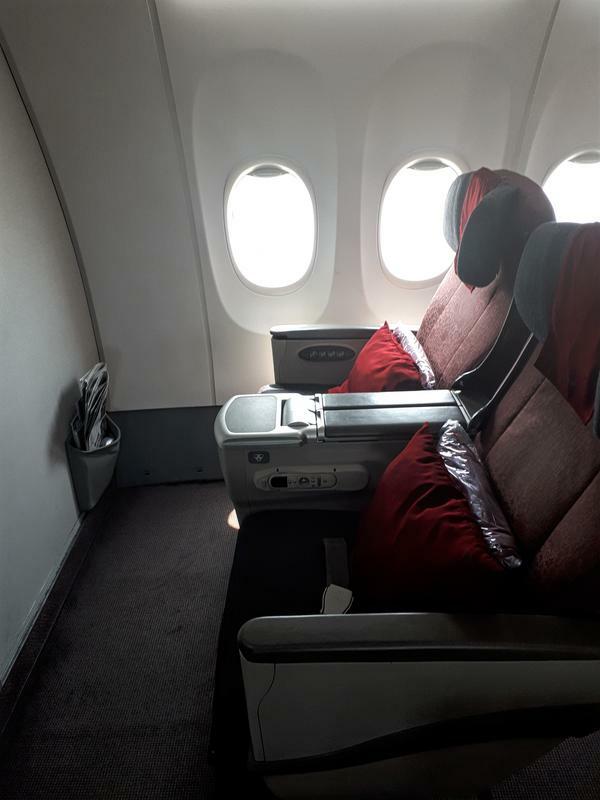 It looked relatively new – and there were proper recliner seats in business class. Seats were very comfortable, and I had no complaints at all about my seat 6A - the first seat at the bulkhead at the left side of the plane. 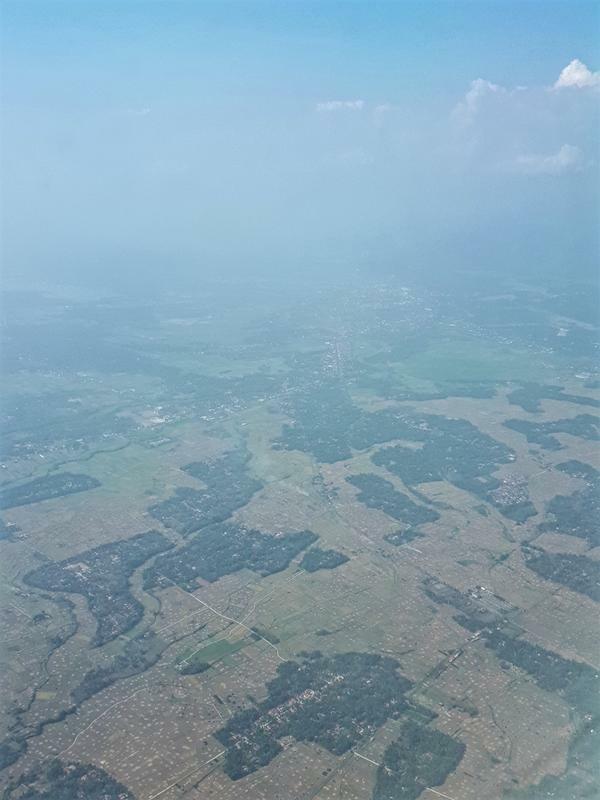 There was however no personal entertainment system and no wifi on the plane - the only form of entertainment being the window, the overhead screen showing the route (which malfunctioned as it weirdly showed us flying CGK-CGK) and some booklets. I forgot to check if the seats had power plugs of any kind. Upon seating, the friendly FA again welcomed me on board and asked if I would like a welcome drink. No alcohol on board Indonesian domestic flights unfortunately, so I took an apple juice. 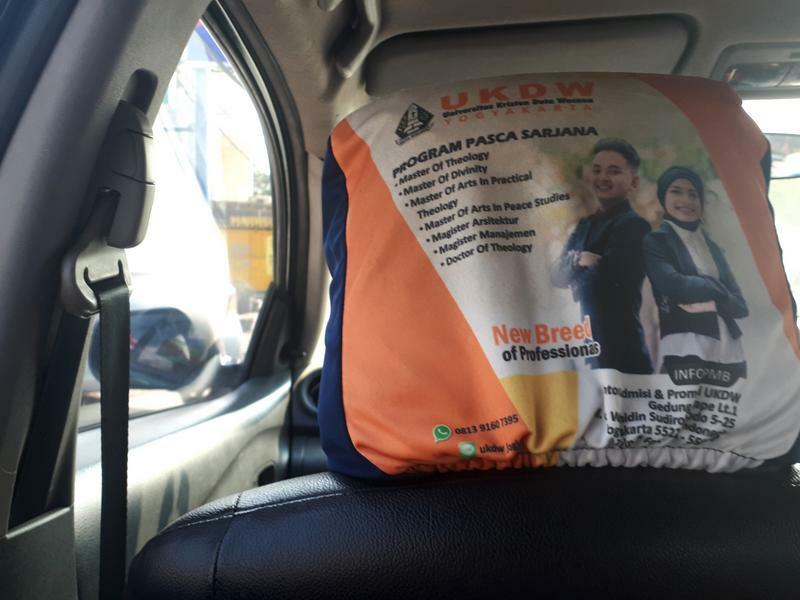 Refreshment towels were being distributed as well. 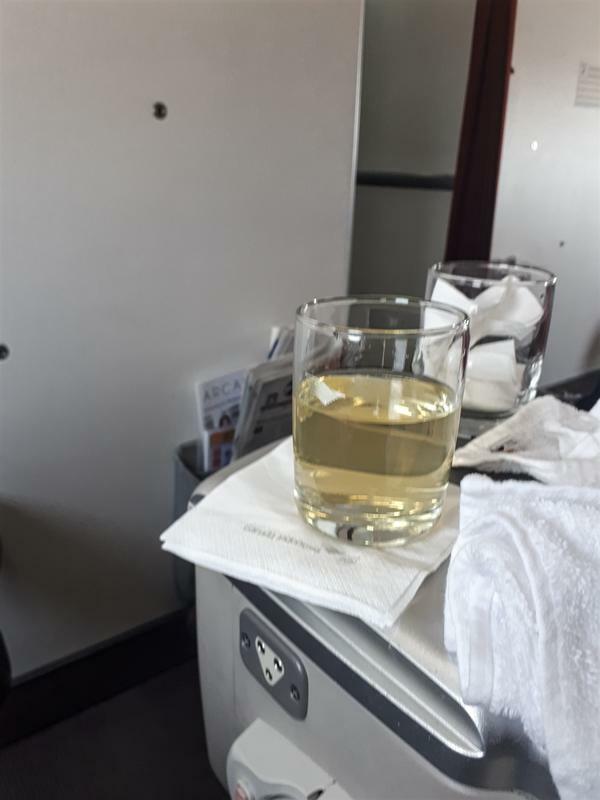 The flight seemed to have a full load, both in business class as in economy. With a 30 minute delay, we left our gate and taxied around the airport towards the runway. 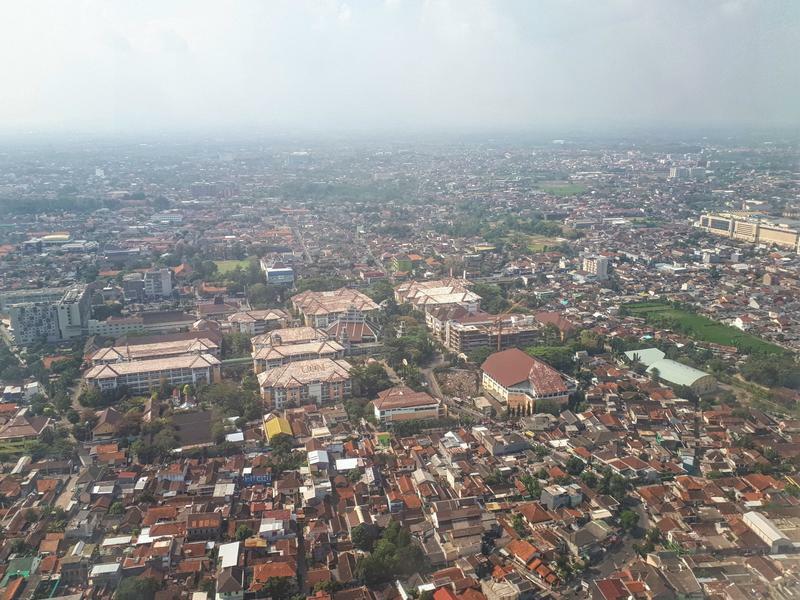 There were again some cool views over the sprawling city of Jakarta covered in its eternal smog. Immediately after the fasten seatbelts sign went off, the crew jumped into action and meals (or well, more of a snack) were being distributed. 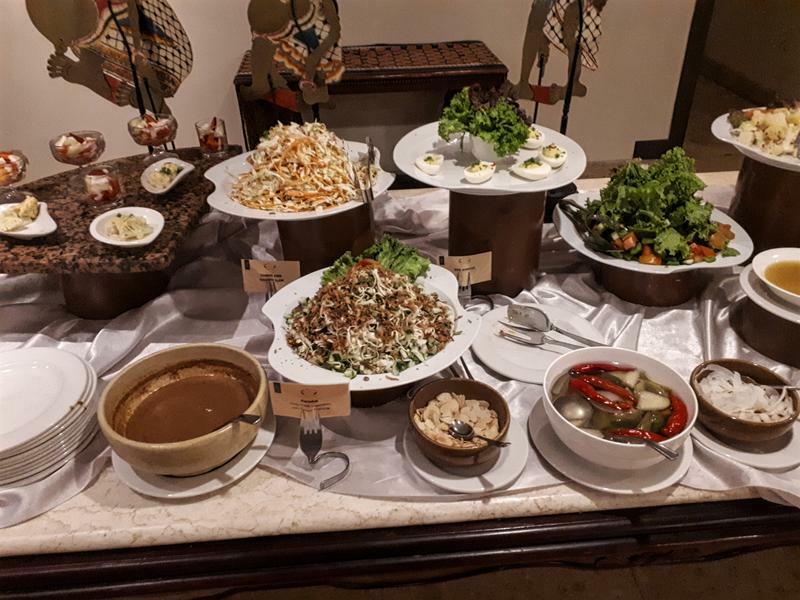 The meal consisted out of an hamburger, two pieces of carrot, two pieces of some legume, and a fruit bowl. I had a glass of water with it to wash it all down. Meal quality was decent enough and even though the hamburger looked a bit sad with its small patty and lukewarm temperature it wasn't all bad. 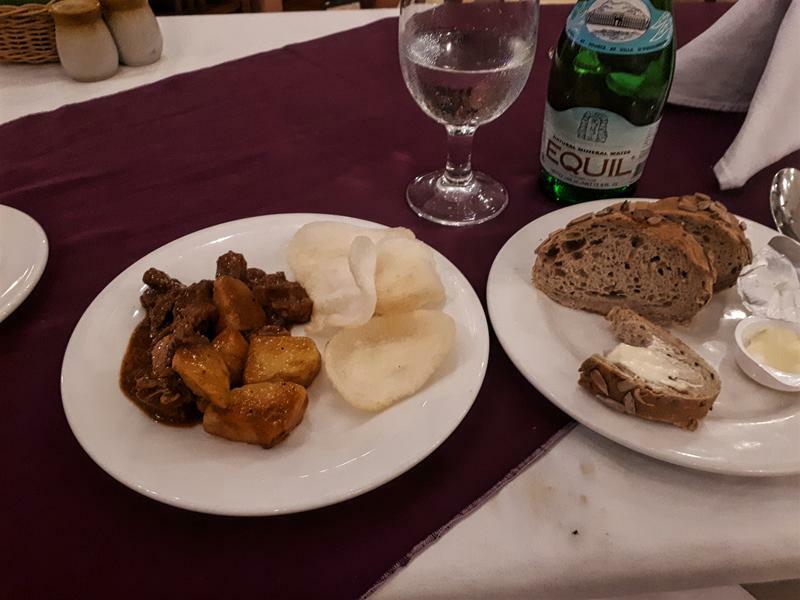 Sure, I've seen better meals with quite a few airlines even on such short flights as this (flying time some 45 minutes at most?) but it wasn't bad either. The FA even managed to ask if I wanted to have another drink – which I politely declined. 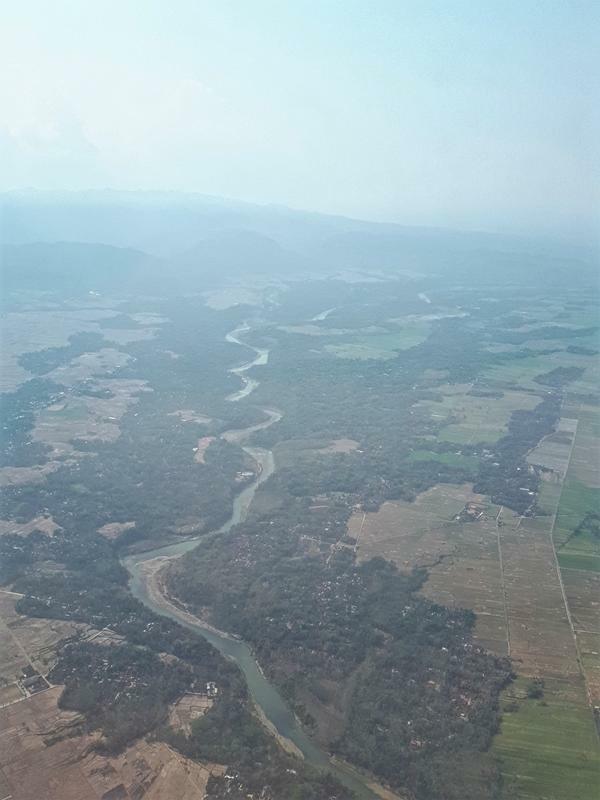 The service was fast, friendly and organised – and that's all you can ask for on flights this short. 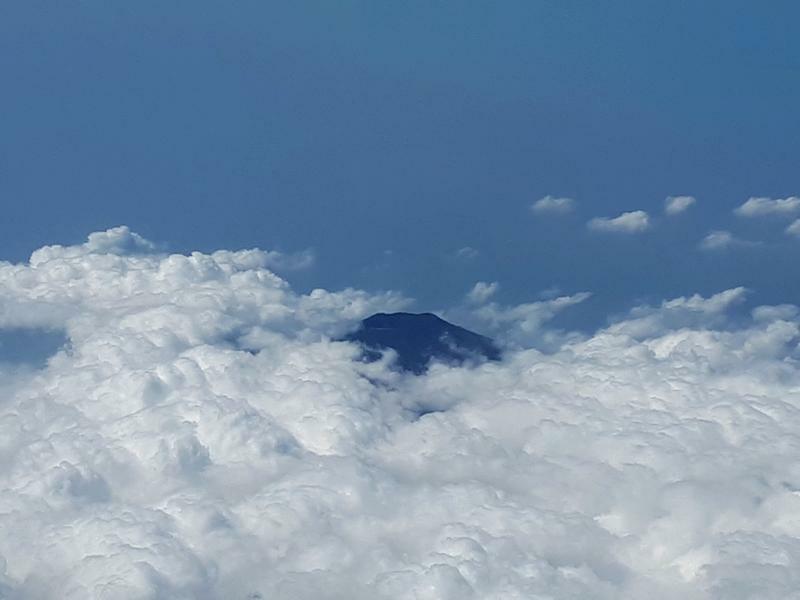 There were some stunning views flying past a volcano with its peak sticking out of some clouds. Not a sight I see often on my usual flights within Europe! 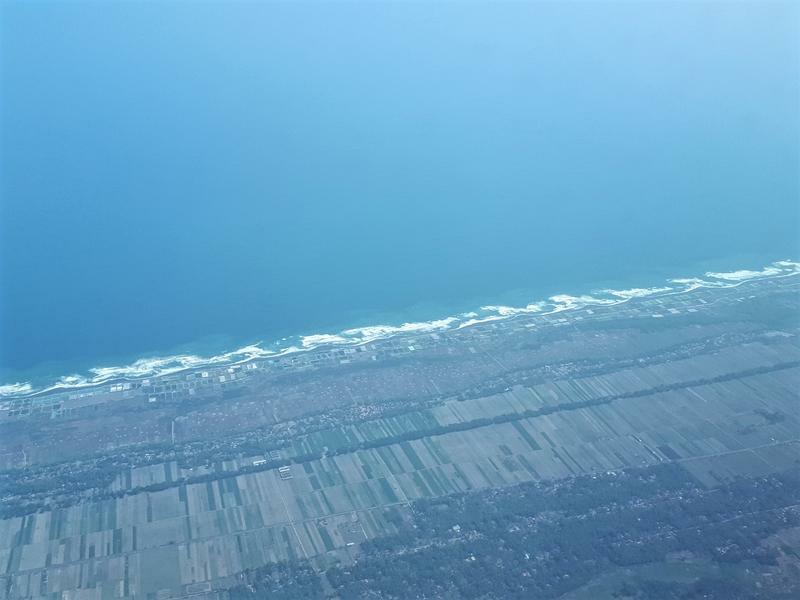 There were some beautiful views as well over the Southern Javanese coastline upon descent into Yogyakarta. 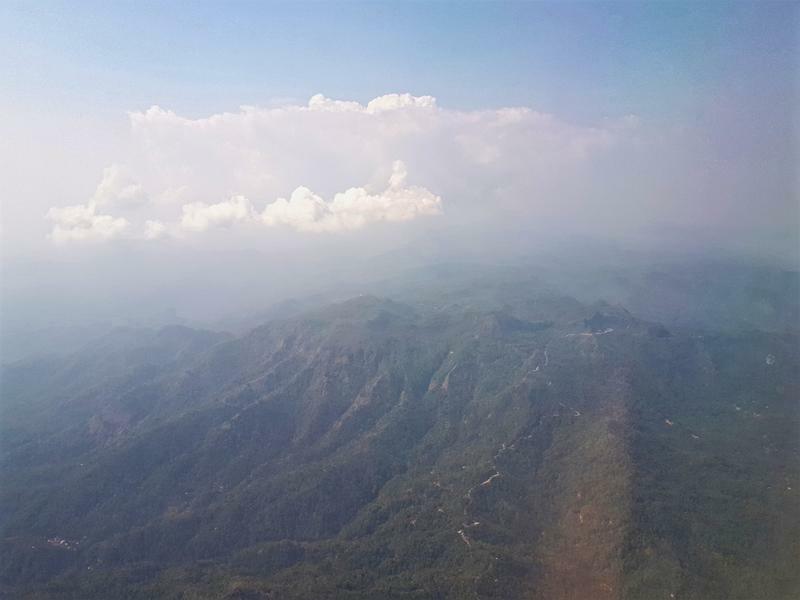 I am actually never scared when flying, but somehow there were some moments upon landing when I felt a bit insecure. 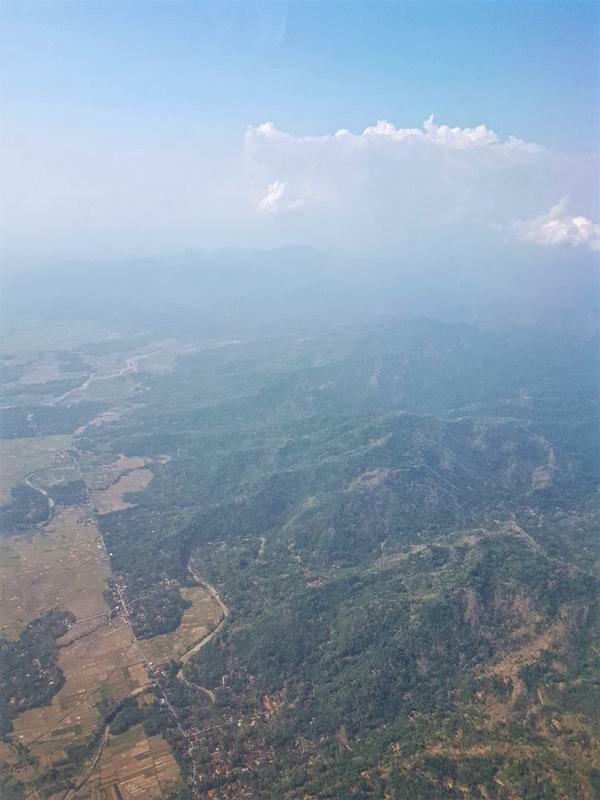 I don't know if it is the knowledge of Indonesia's not-so-good safety record, but making some abrupt, very sharp turns at relatively low altitude over the foothills of the volcano surely did not contribute either. I still feel a bit weird about it, as on I don't know how many of hundreds of flights before I only had such a feeling once in my life as a teen before boarding a plane. 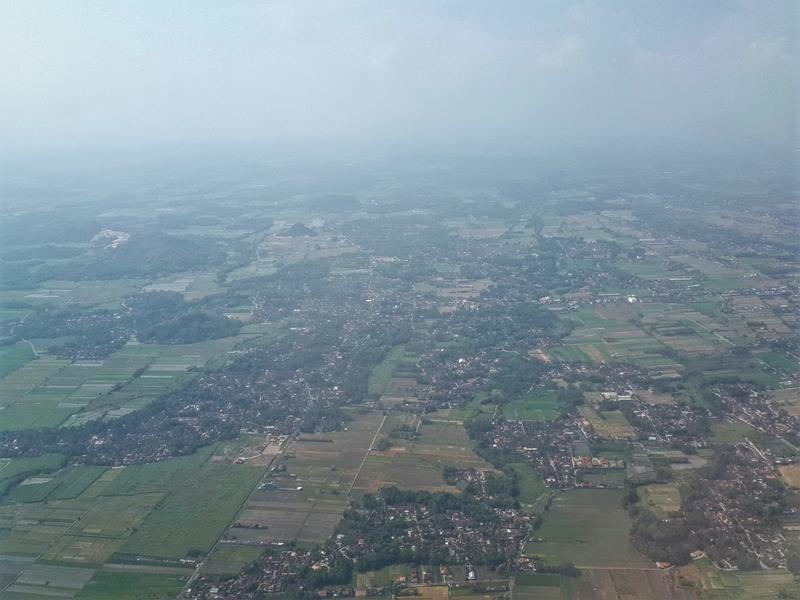 And on the 18 or so flights I took after this, flying again felt like taking a walk in the park. I guess no matter how much we fly there are always such moments! 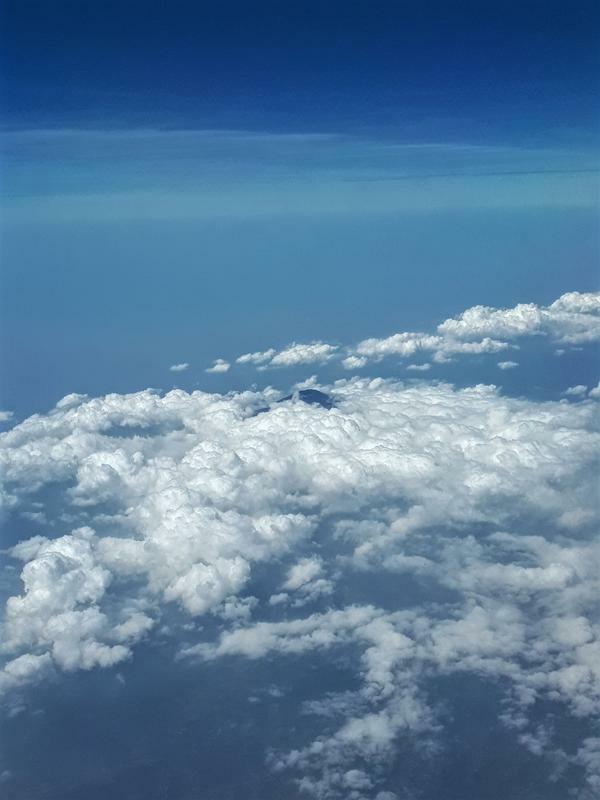 Once out of the holding pattern and having cleared the volcano, it became much better as it was a straightforward descent over the coastal plain straight into YOG. YOG seemed to be a very friendly airport on arrival. 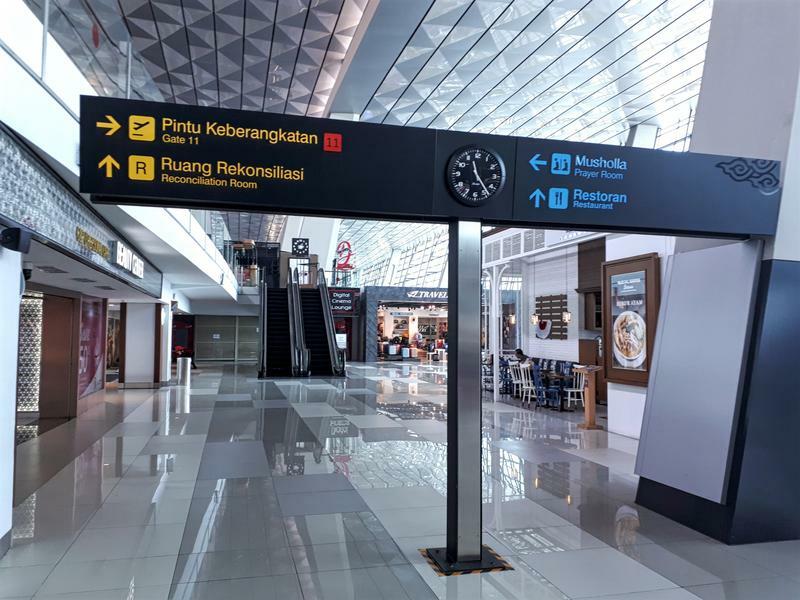 There are several taxi stands at the airport offering fixed fares to the city centre – which is just a few miles away as the airport road basically leads straight into the city centre. 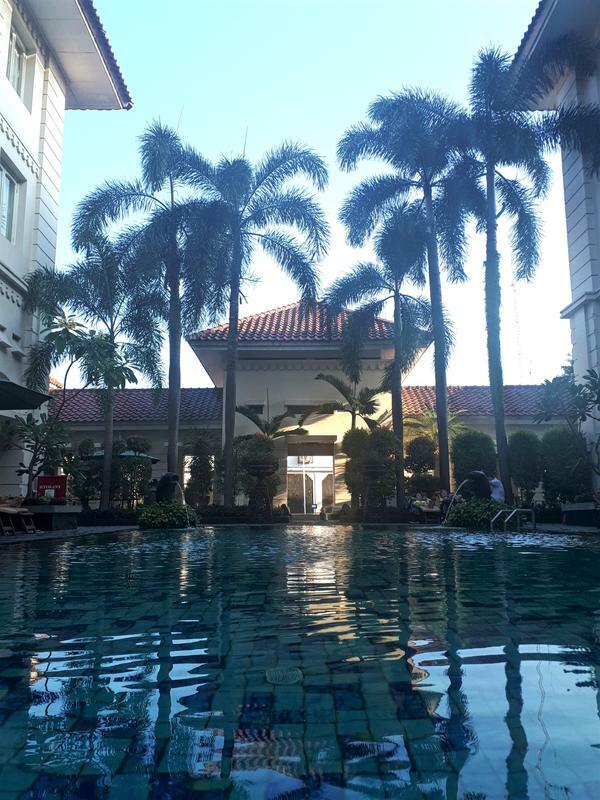 A short 20 minute taxi ride later and I arrived at my hotel for the next three nights. In short: You can't complain much for a short domestic hop like this. Sure, the flight was not groundbreaking. 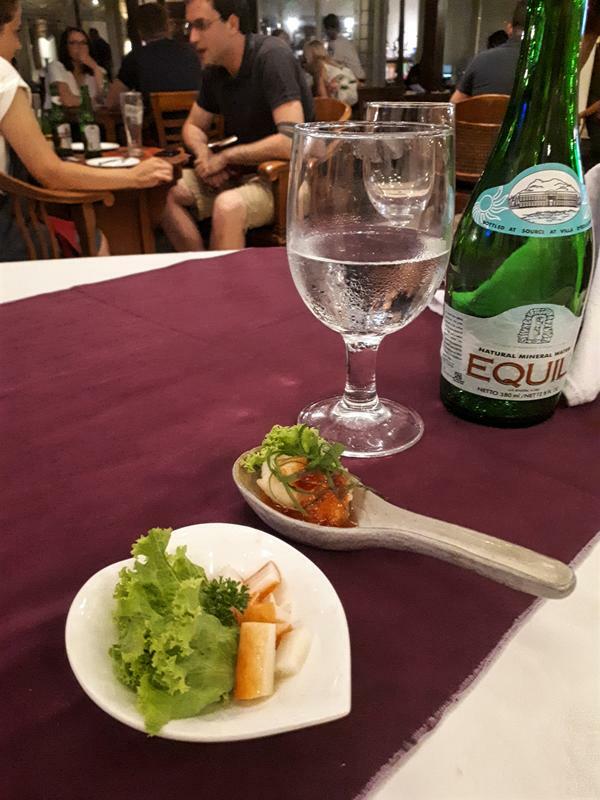 But the seat was super comfortable, the crew friendly and efficient, the meal decent. And the price for the ticket was excellent – with J only some 40 or 50 EUR over the cheapest tariff in economy at the time of booking. 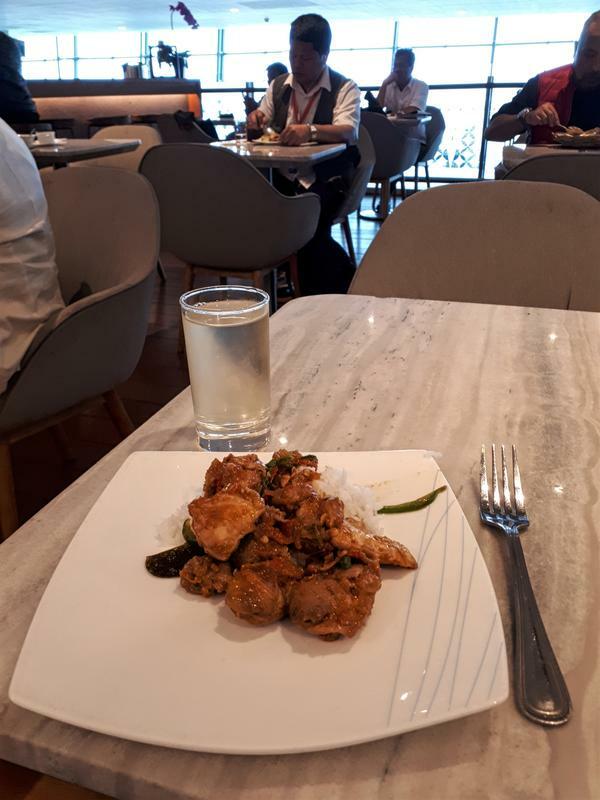 With such a relatively small surcharge for business class – I would definitely book like this again the next time I travel domestically in Indonesia. 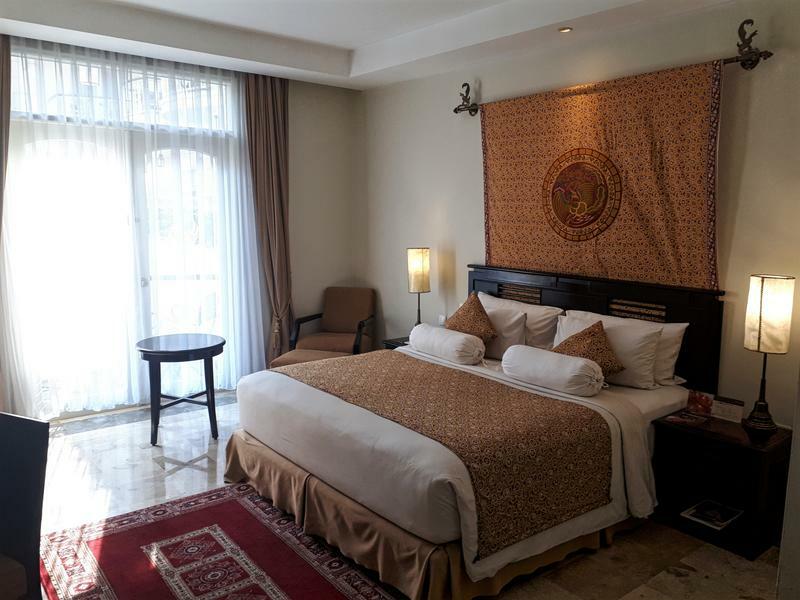 Next up: The Phoenix Hotel, Yogyakarta, and the UNESCO World Heritage Sites of Borobudur and Prambanan. 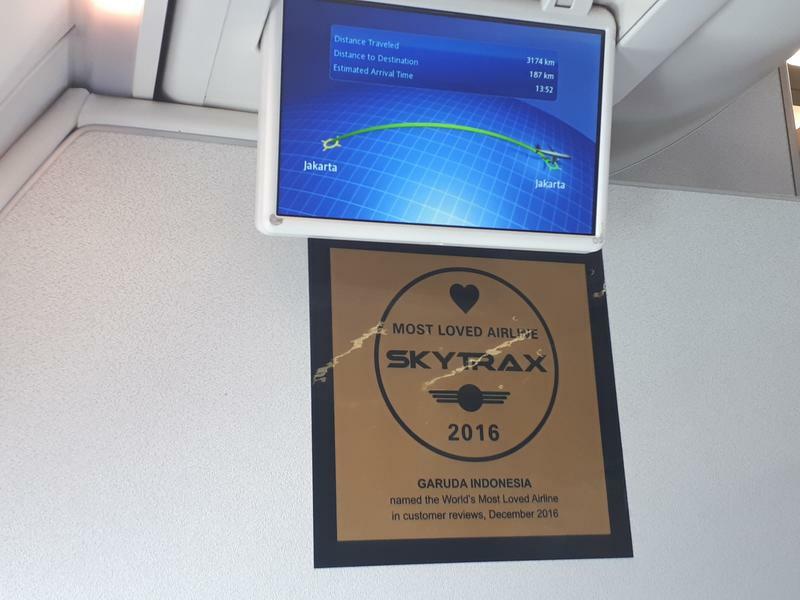 There are power outlets between the seats almost at floor level on Garuda J 737 and 330 seats. You would have been flying around Mt Merapi, my last visit to Yog - Merapi was erupting, YOG had been closed on the Saturday and Sunday - as the ash cloud was hovering over the city - but on the Monday the winds changed and the plume went North east - I have amazing pictures of the volcano going off as we flew past . 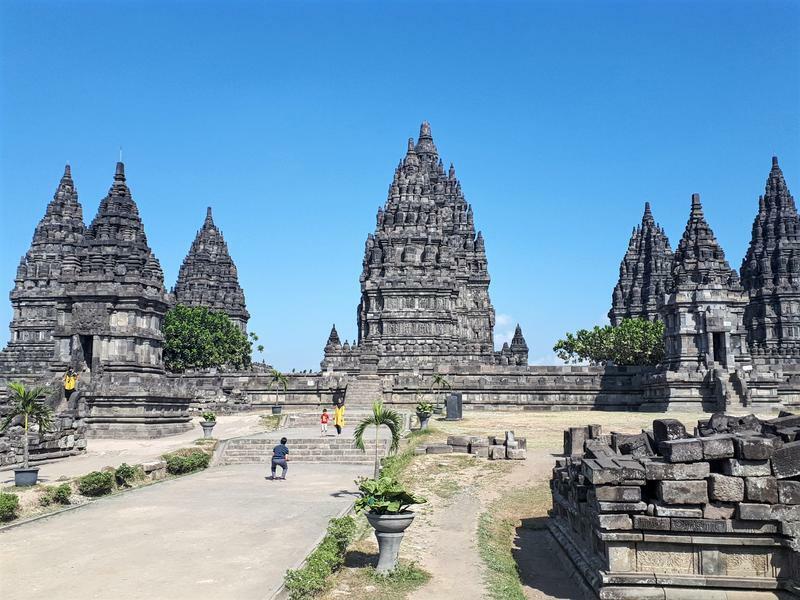 Borobodur and Prambanan are wonderful temples - I great enjoyed my visits there. 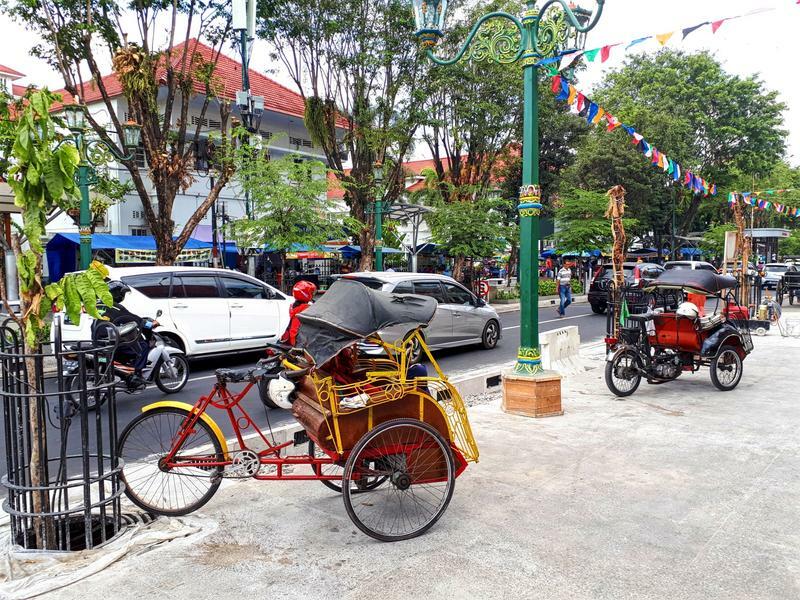 Jakarta has little to offer except shopping - I prefer to go to either Kuala Lumpur or Bangkok if thats what I intend to do. 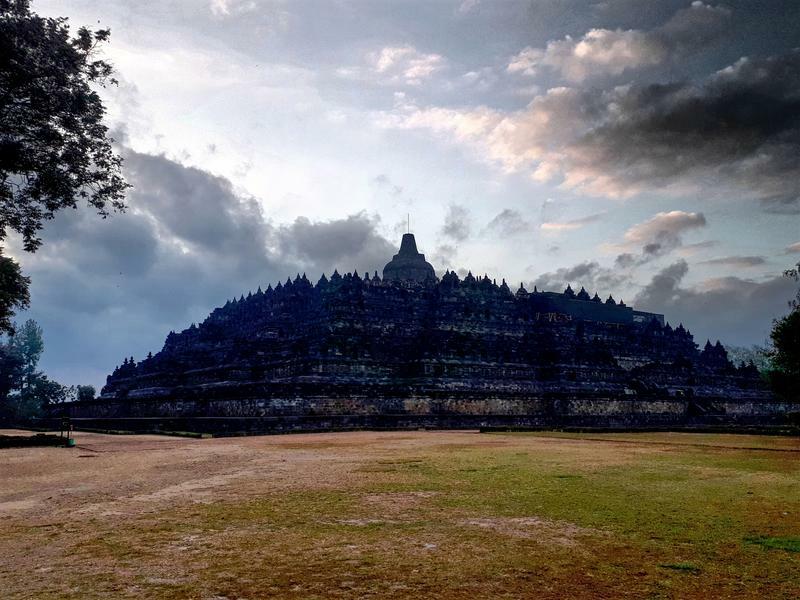 Indonesians are very hospitable, and if you manage a few words in Bahasa and show respect - they will treat you with great respect. I indeed heard and great reports similar to your tale about Garuda. Would love to try them out once on a longer distance route, like ex-AMS or LHR. Do they actually still have a first class cabin on board too on these flights? 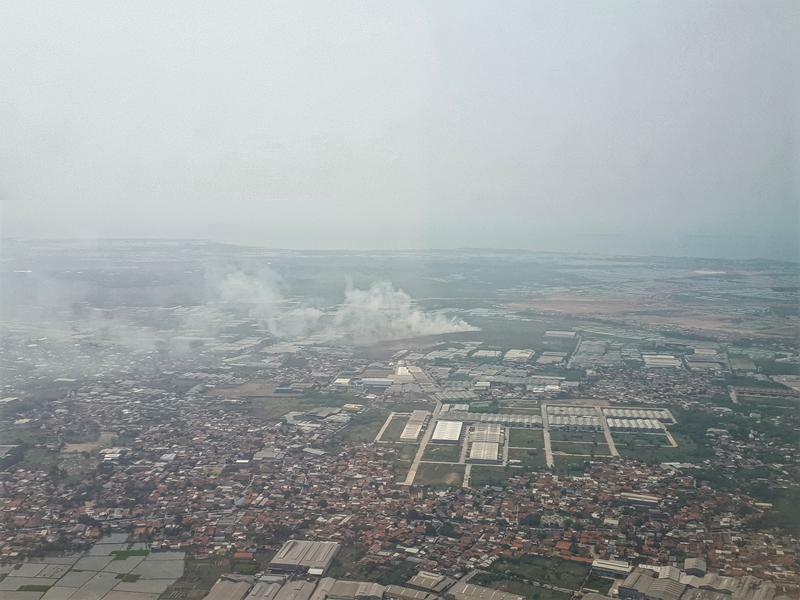 As I read many conflicting reports about Garuda taking it out/keeping it as it seems the airline bosses doesn't really know in which direction to take the company. 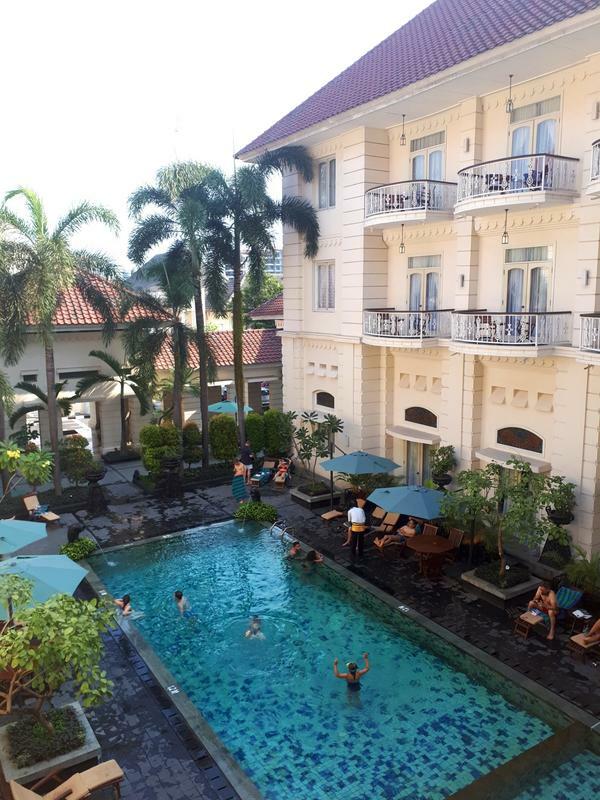 For my three nights in Yogyakarta I opted for the Phoenix hotel, another Dutch-era historical hotel. 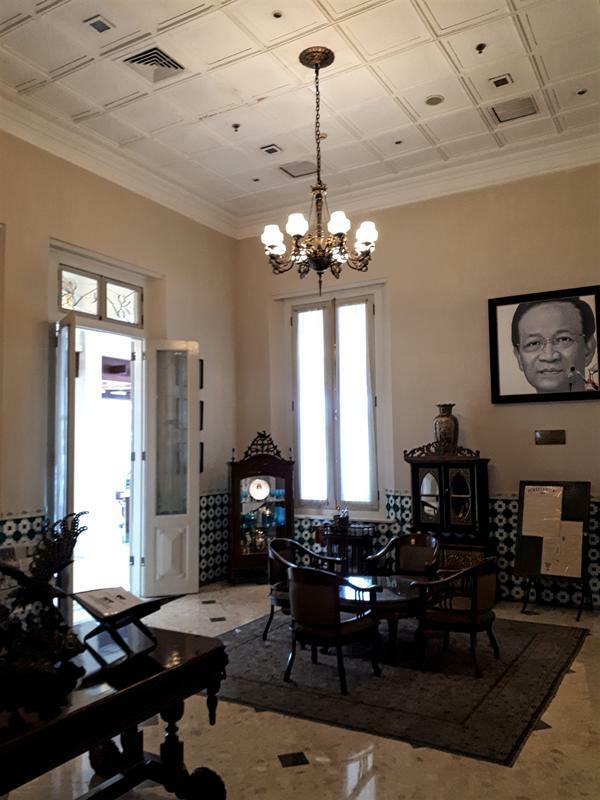 Built in 1918, it began life as the luxury house of a rich Chinese merchant, became a hotel in the 1930s, and after Indonesian independence even served as the mansion of the Chinese consul, before becoming a hotel again in 1951. 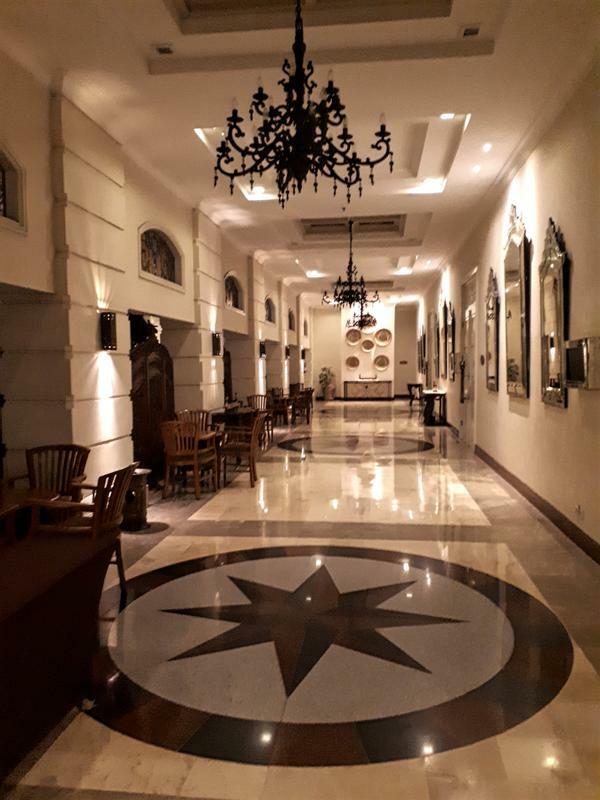 Check-in was a quick and friendly affair and I was escorted through the large complex to a separate building overlooking the hotel's courtyard pool. 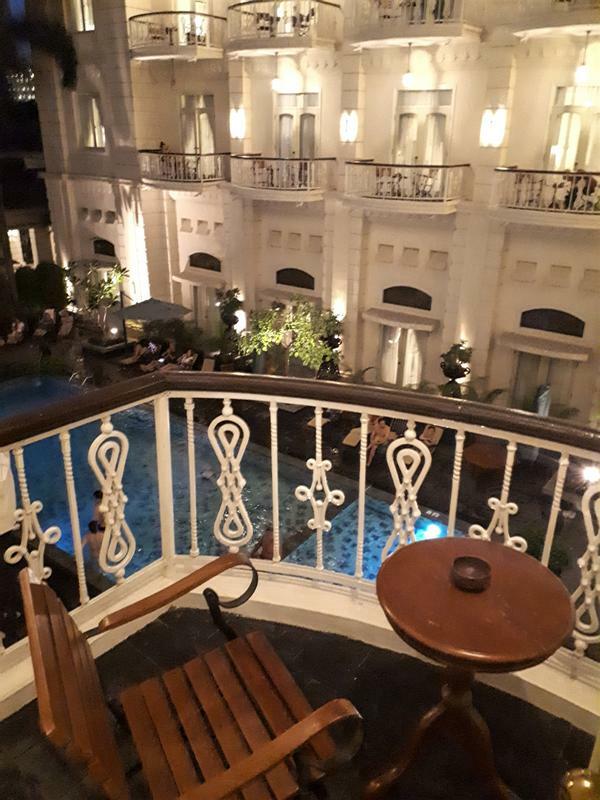 I contacted the hotel in advance for a pool room view, and got an answer that for an additional 10-15 EUR per night surcharge I could have one. It turned out to be well-worth paying it. 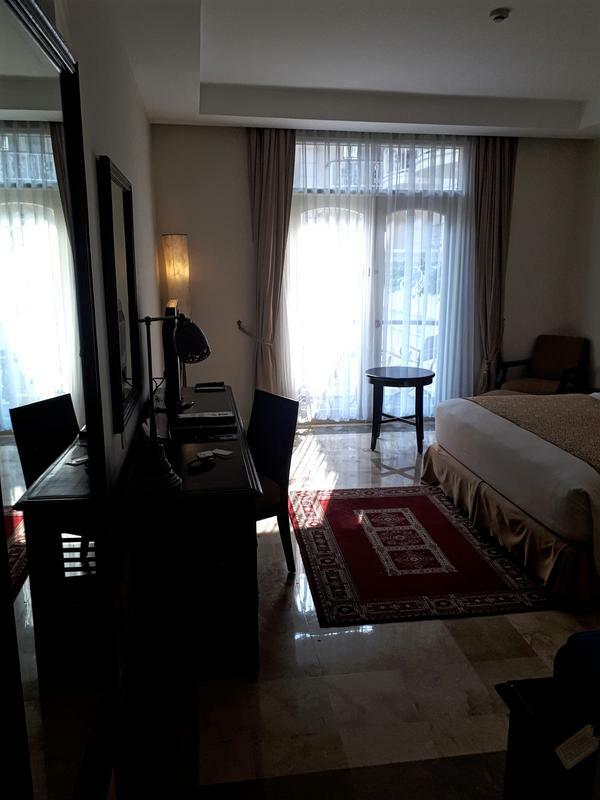 The room was comfortable and was nicely decorated, although there was quite some wear and tear. 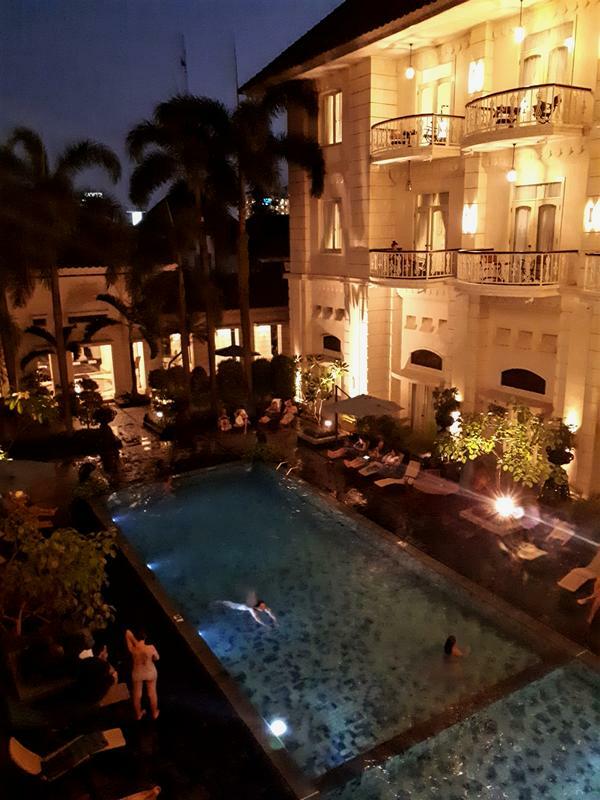 By far the best in the room was the balcony which had a lovely view over the pool. The swimming pool was a nice feature during the day but got quite crowded in the late afternoon! It was however much, much better early in the day and in the evening. 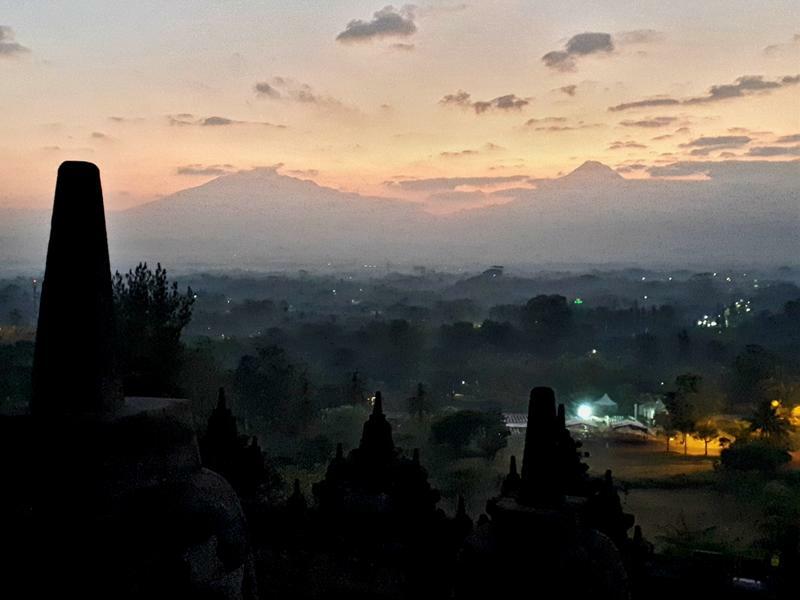 I didn't had breakfast included with the room rate as 2 of the 3 nights I had to wake up early (one for a sunrise visit to Borobudur, one for a very early train on departure to Surabaya). 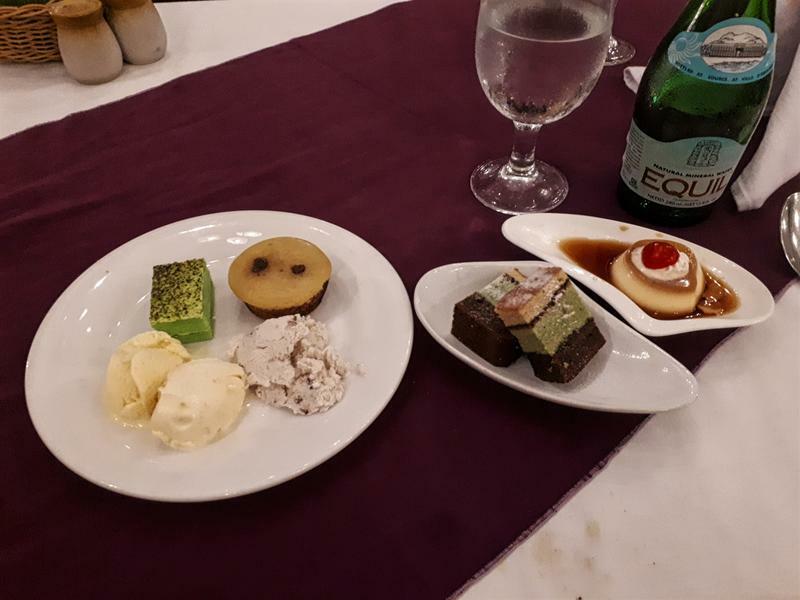 Instead, I just visited a nearby bakery for some yummy buns and pastries, and made myself some instant coffee with the water boiler in the hotel room and complimentary coffee (and tea) available. 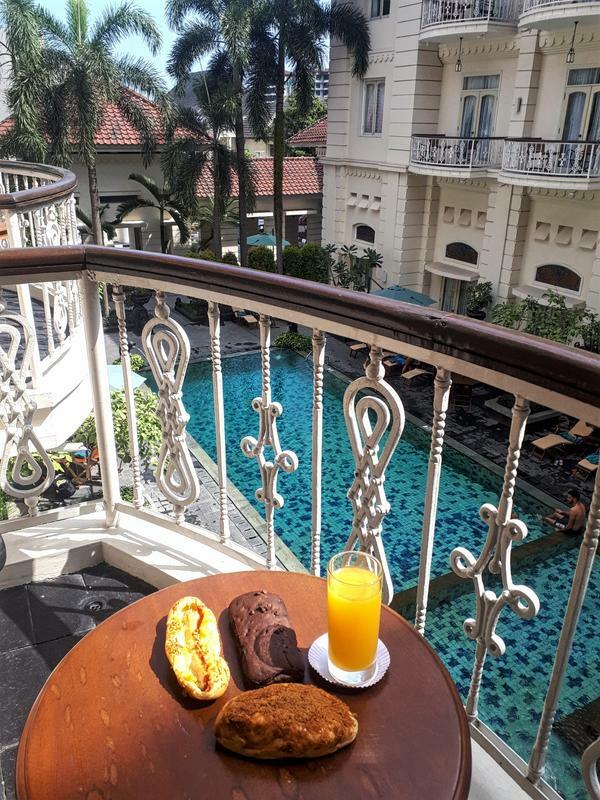 Nothing beats enjoying breakfast on the balcony! 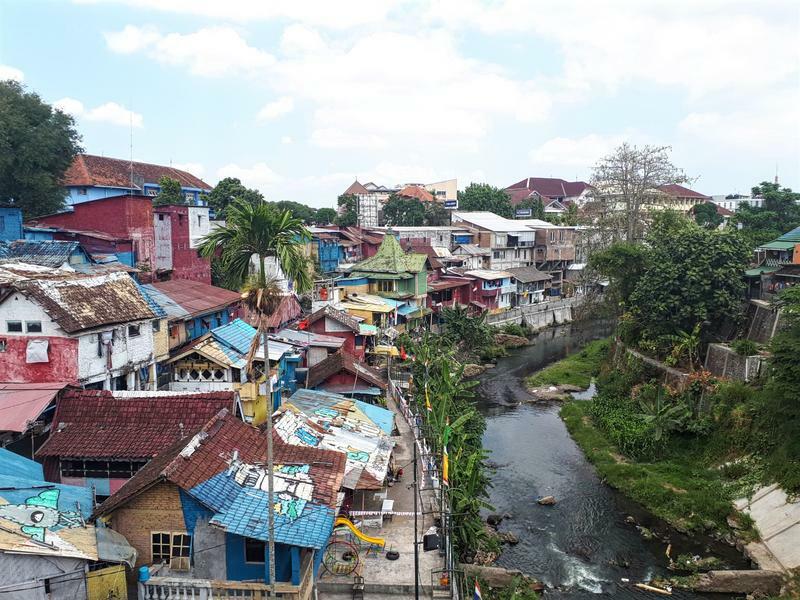 As I wrote in my earlier post, due to unforeseen circumstances I had to work for most of my time in Yogyakarta. 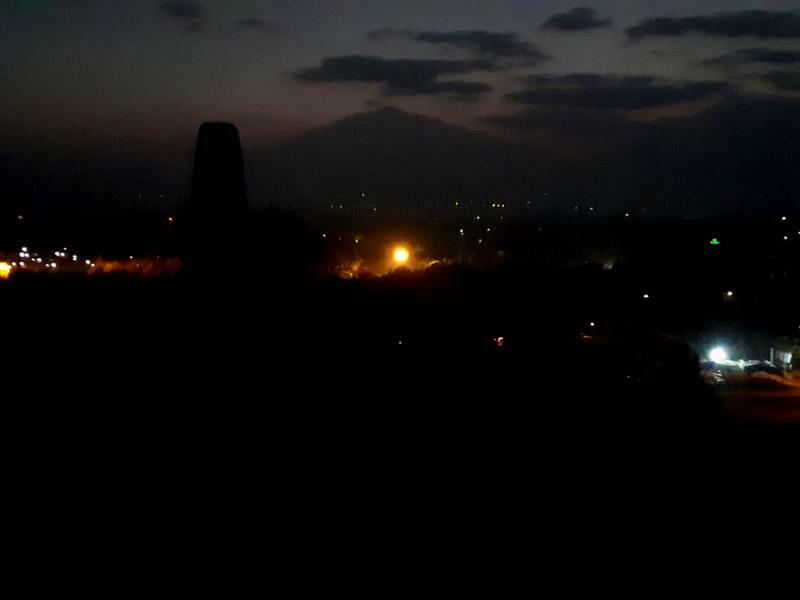 Most of the time I was just sitting behind my laptop at the desk of my room or out on the balcony working.. Fortunately I was still able to see Borobodur and Prambanan, but apart from that did not manage to do as much as I hoped to. I only managed a quick 2-3 hour walk around time. 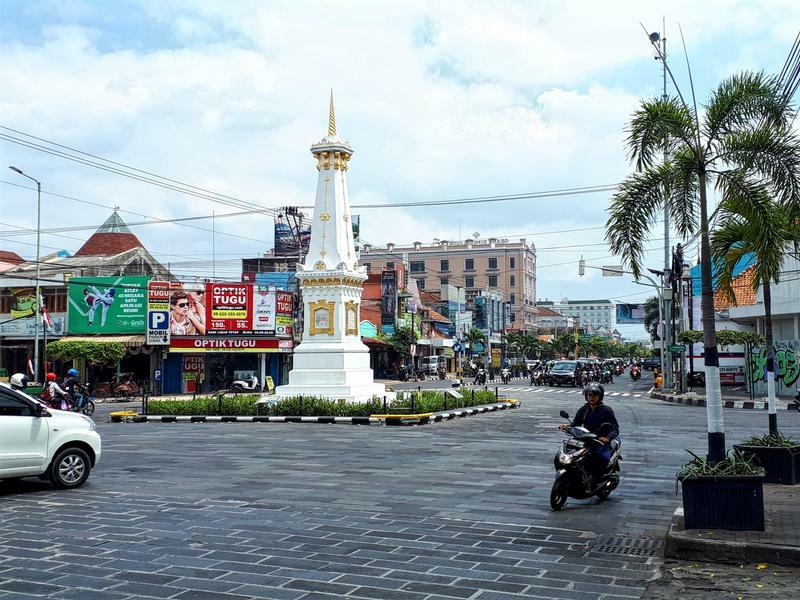 Yogyakarta seemed like a pleasant enough city with some friendly locals. As I was working remotely on normal European office hours, it meant my “working day” started at around 2pm and lasted until 9pm. 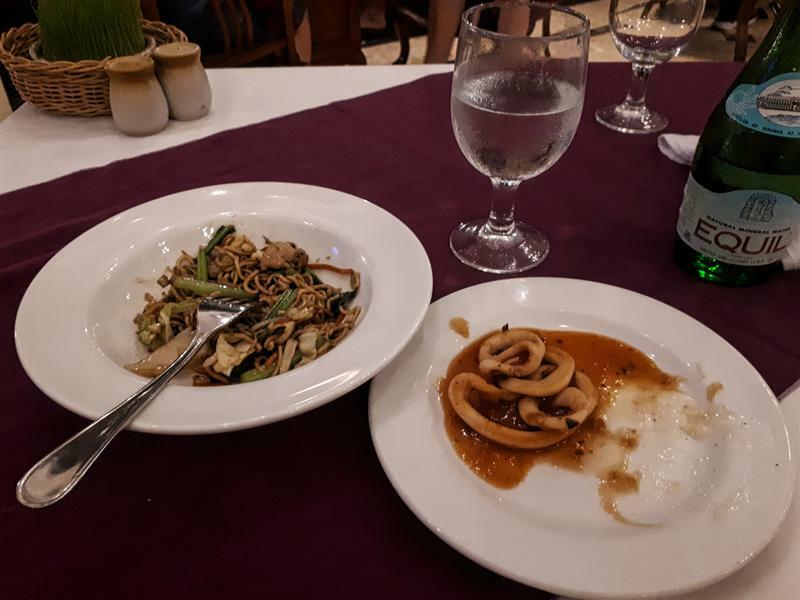 Unfortunately, this meant it was not really feasible to visit any of the restaurants in town, so I decided to eat for three nights at the hotel. 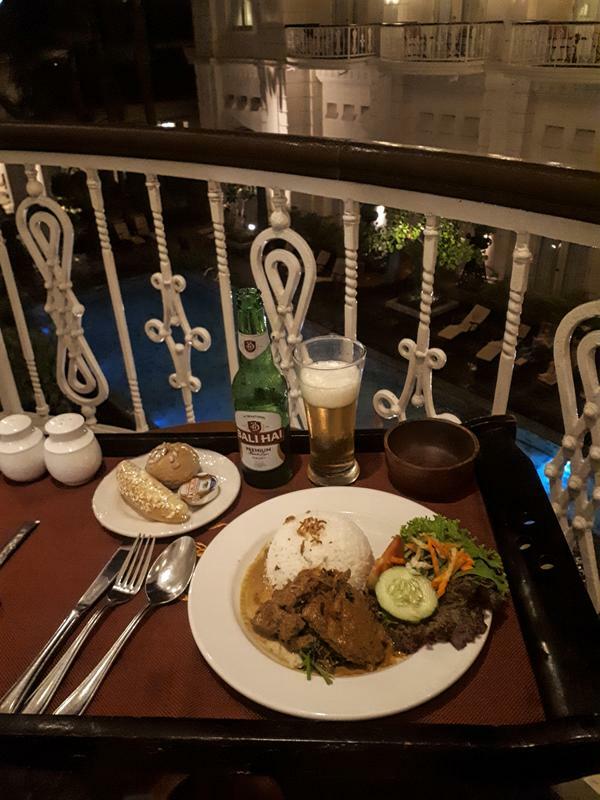 For two nights straight I ordered some Indonesian dish from room service – the food was OK but certainly not memorable. 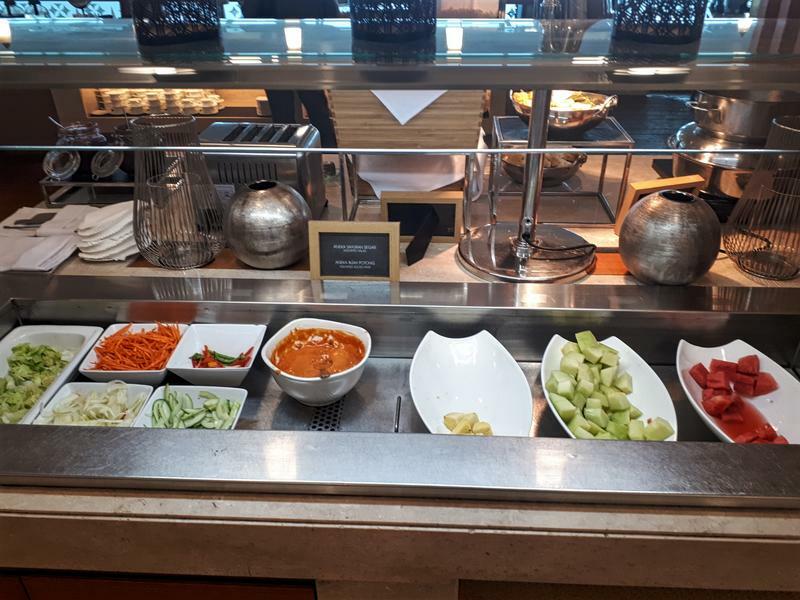 One of the nights, one of the hotel restaurants organised a “foods of the world” themed buffet – which at around 15 EUR was decently priced. 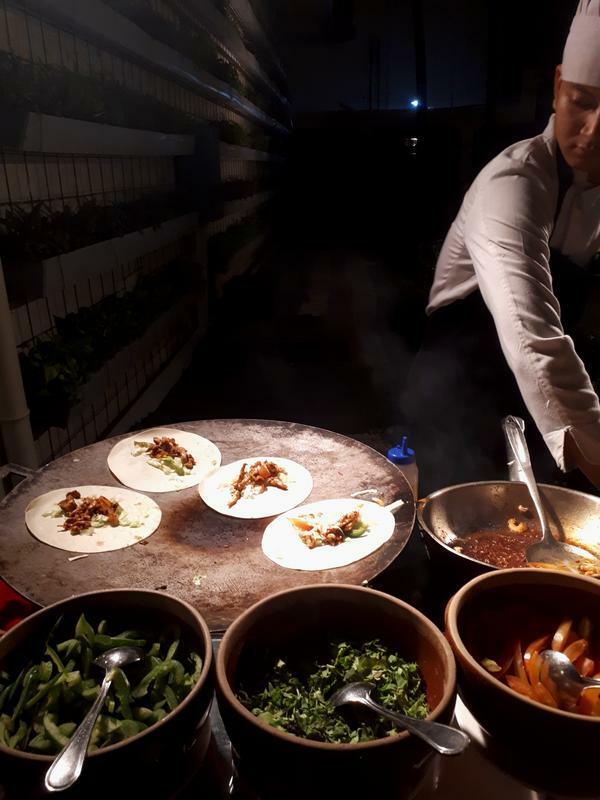 There were some live cooking stations (for example one for Indonesian food, one for burritos) and a wide variety of other dishes. 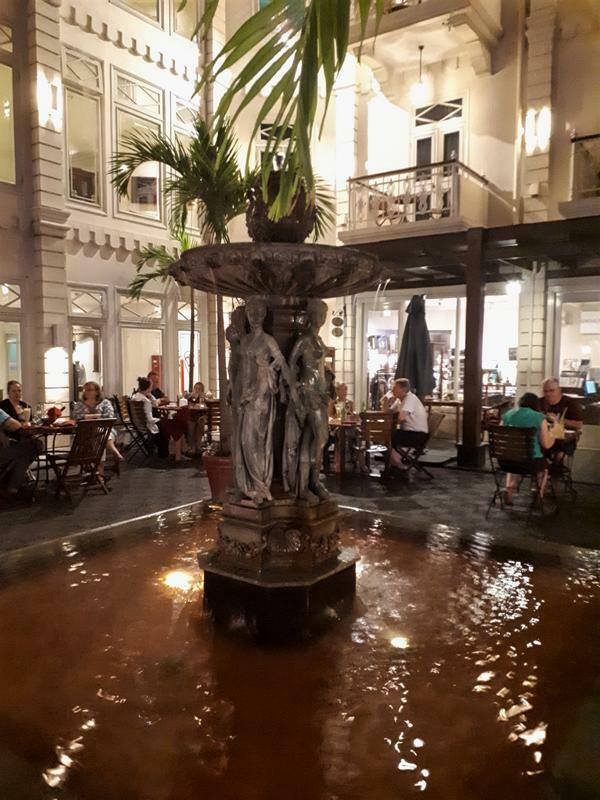 In short: I liked the Phoenix hotel and wouldn't mind staying again at all, but it didn't blow my mind away. If staying here I would certainly recommend paying a bit extra for a pool view room as it was well worth it having a nice view. 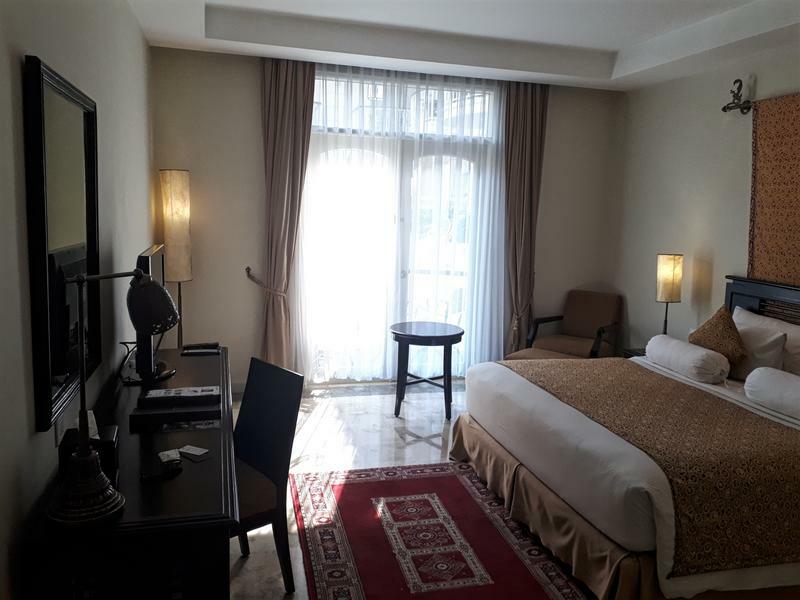 Service was friendly throughout the stay, the room nice enough, the food OK. And they were of great help organising the trip down to Borobudur and Prambanan, offering a very decentlly-priced private transfer. 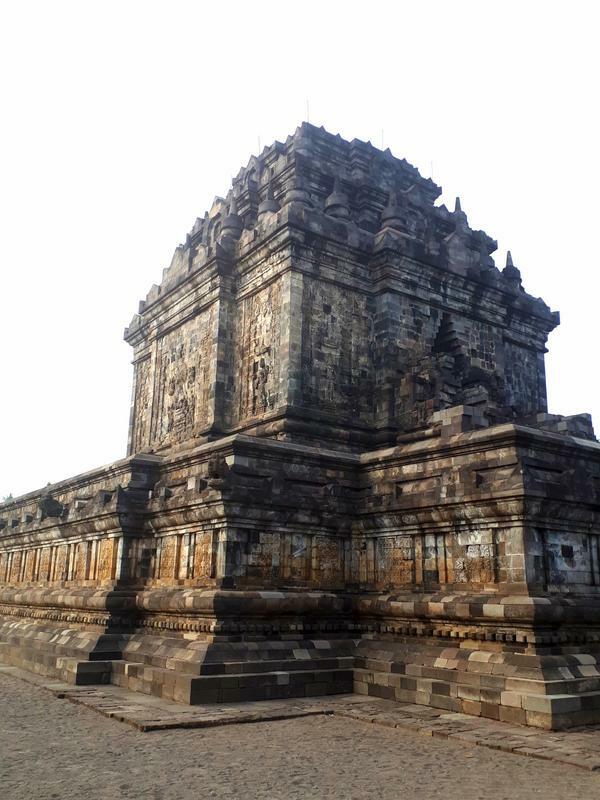 Yet compared to the Hermitage in Jakarta, and my later visit to the Majapahit in Surabaya, it clearly fell short in many smaller details. 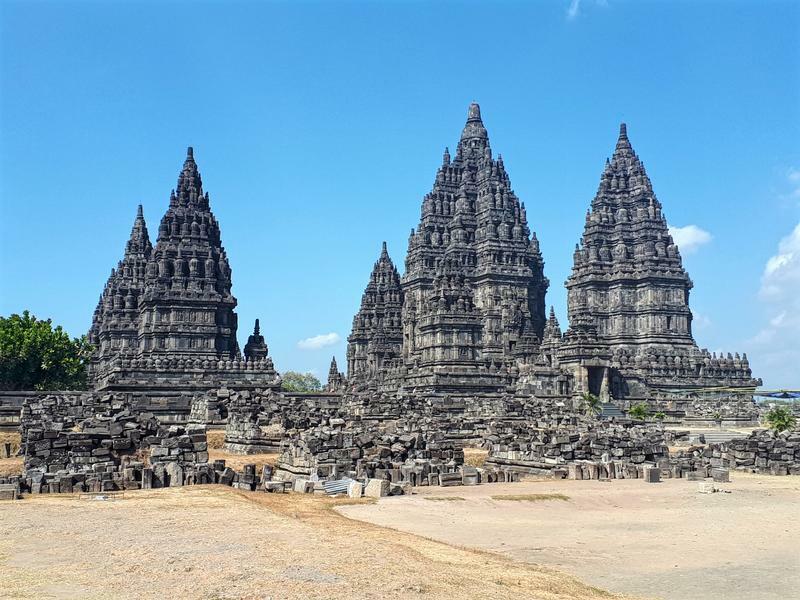 Next up: The amazing UNESCO World Heritage Sites of Borobudur and Prambanan. offerendum and Chinatrvl like this. 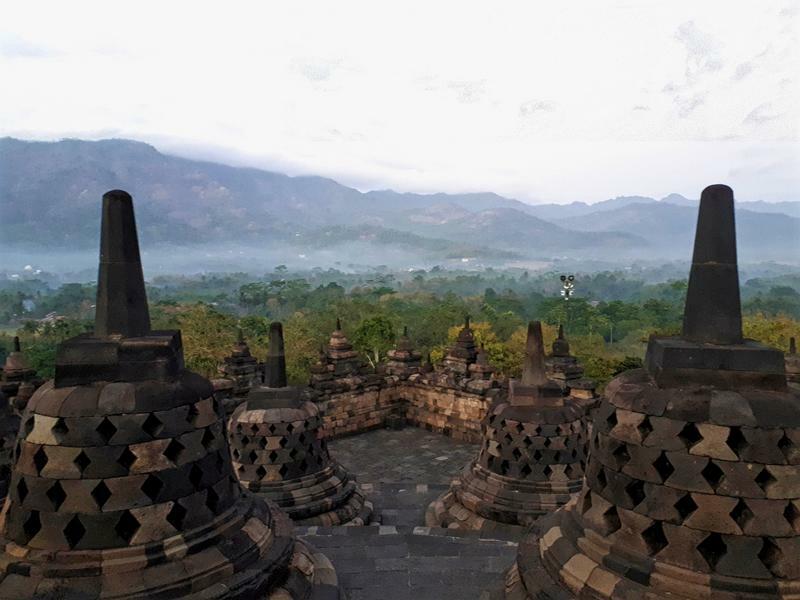 Borobudur is a 9th-century Mahayana Buddhist temple some 40 kilometres or so out of Yogyakarta. 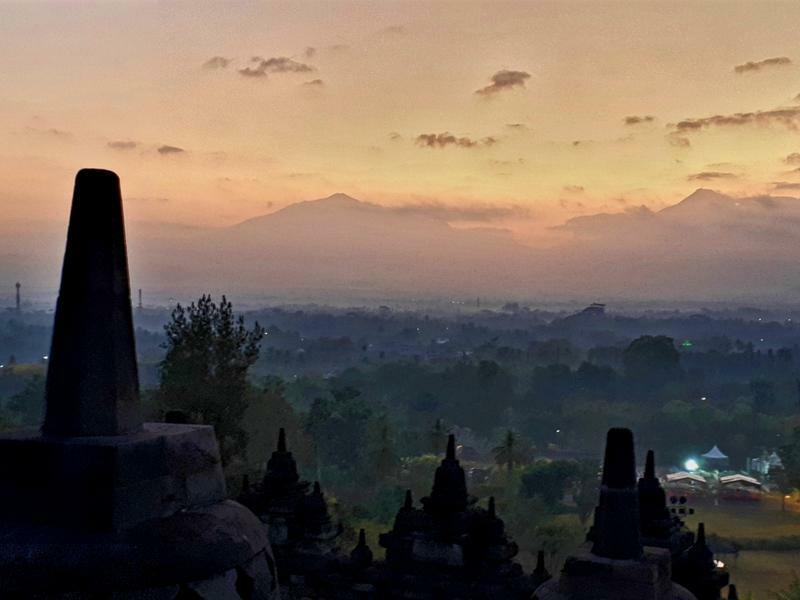 It being the world's largest Buddhist temple, Borobudur has nine stacked platforms and is topped by a central dome. 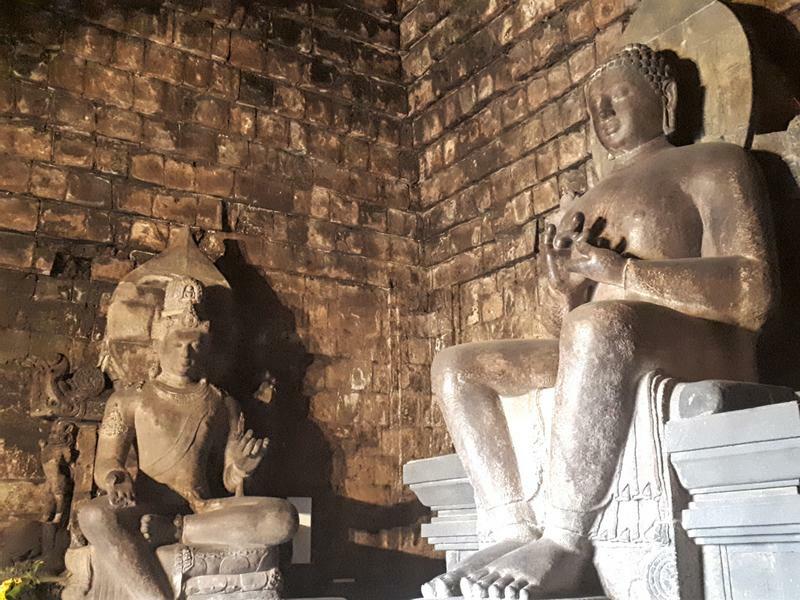 It has more than 2,600 relief panels and 500 Buddha statues depicting scenes out of daily life back then among the locals and royals alike. 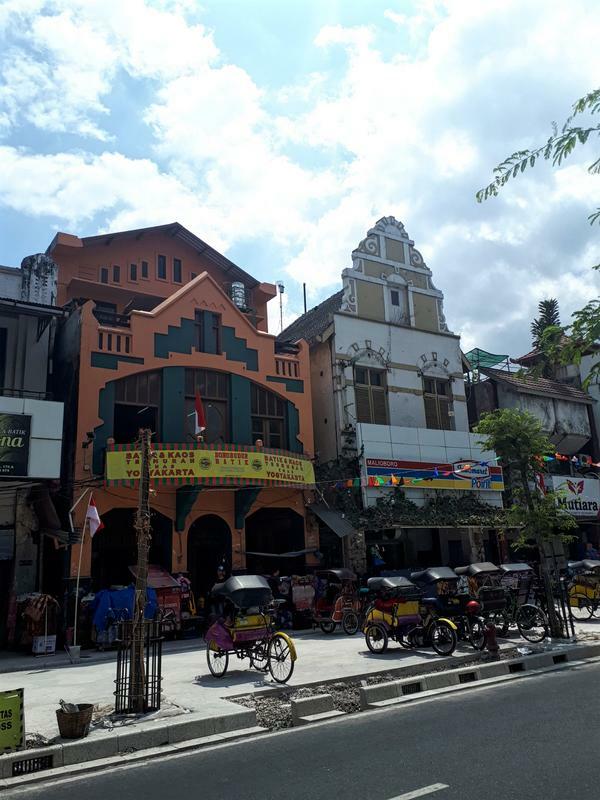 Access is fairly straightforward from Yogyakarta, and any hotel can organise a tour. 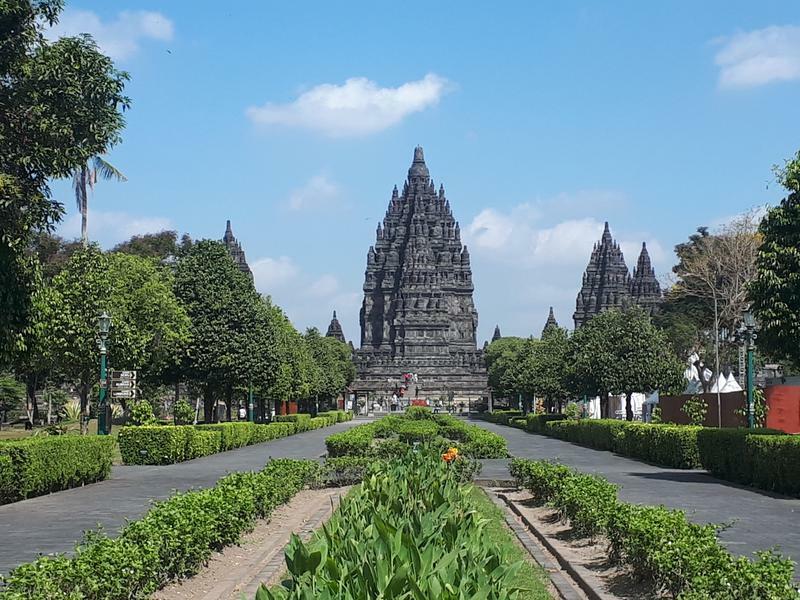 I opted just for a private driver to take me to Borobudur and Prambanan, which was very decently priced at about 30-40 EUR. Entrance fees were extra. 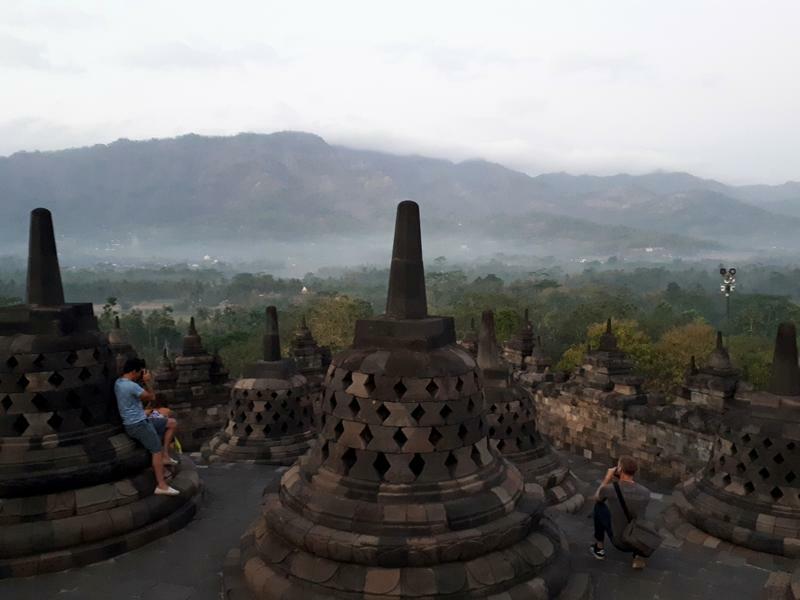 I woke up early at 3.30am as Borobudur allows visitors in before official opening times to climb the temple for the sunset view. At around 4am, I was picked up from my hotel by a friendly driver in a luxury SUV – with complimentary water bottles being handed out. 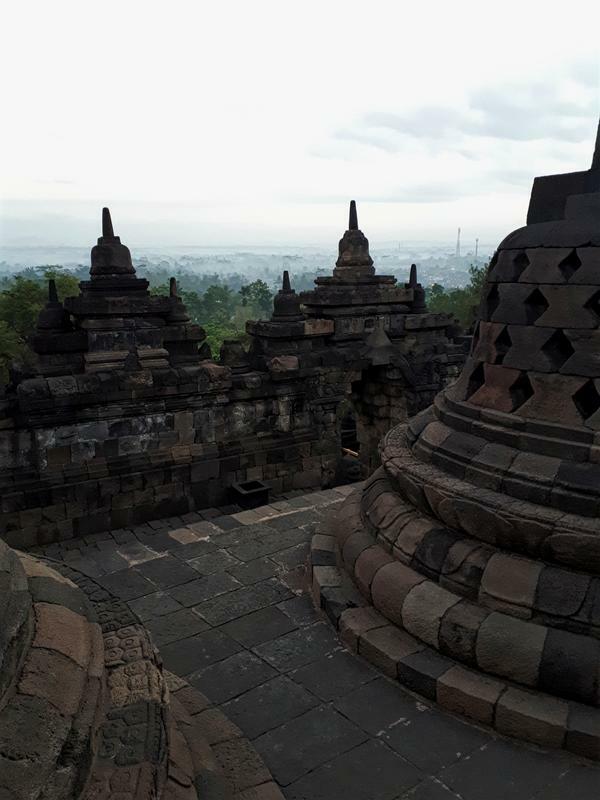 It was about a one-hour drive to reach Borobudur. It was quite crowded this early in the morning. I'm bad at guessing the amount of people, but it would easily have been around 100 to 200 tourists who had turned up this early. Even though I'm bad at guessing numbers, I have a talent when it comes to sense of direction at the huge grounds. Even though arriving relatively late, I was one of the first in the queue at the entrance gate after buying my ticket at the main office. 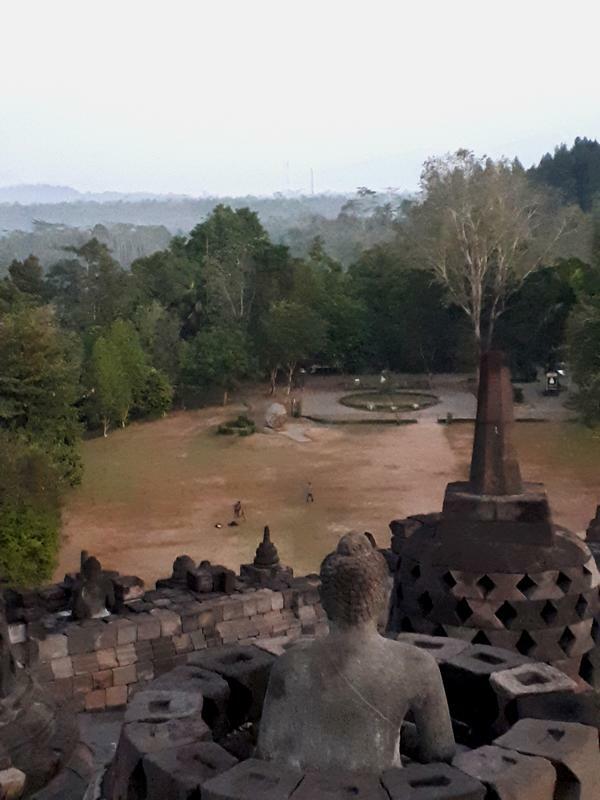 Thanks to my mobile phone, it was also easy to determine the exact side where the sun would rise, which allowed me to snag a great spot high up on top of the temple where hopefully not as many other people would ruin the view. All I had to do now was wait and wait for about 30 to 40 minutes until the sun would come up. 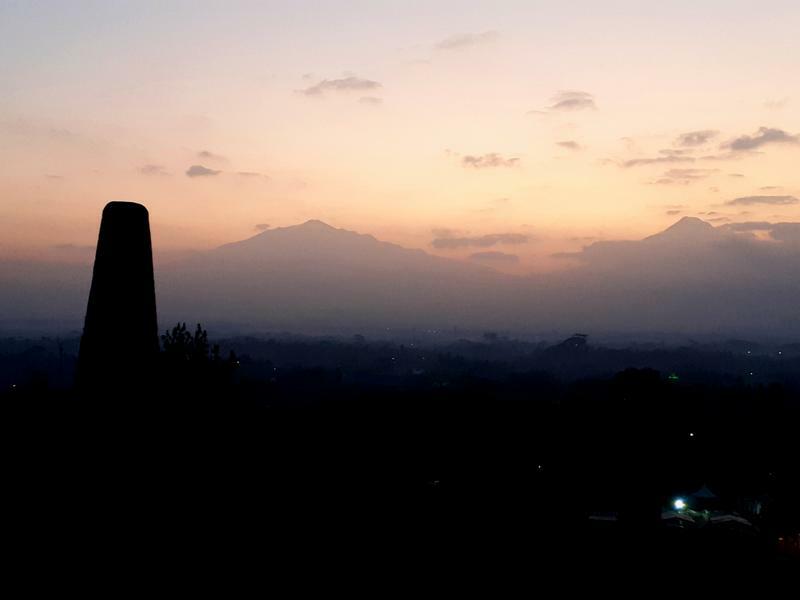 The two silhouettes in the far distance are the twin volcanoes; Mount Merbabu and Merapi – which made an awesome backdrop. The only thing less great are some very bright lights of some buildings towards the East shining directly into your eyes, which of course makes it much harder to take a good photo. The sunrise was beautiful, but not as great as I imagined. At one point also the crowd became a bit too loud, and instead of quietly observing the beautiful sight some idiots started shining their flash light (which were handed out at the temple entrance) into other people's faces. Needless to say, this was not helping with taking pictures either, nor was it nice for those wishing to just take in the view. I decided to have a walk around the complex to the other side as far away from the crowd while most of the people were still seated or standing at the Eastern side. I didn't regret the decision to give up my prime spot on the Eastern sunrise side at all. It turned out that by now the colours and scenes on the very, very quiet Western side were truly amazing, with the break of dawn creating some morning fog between the trees and the first bits of sunlight creating some beautiful colours on the stones. Best of all, there were only 3 or 4 other people smart enough also to take a walk around, so I could savour the moment in quietness. 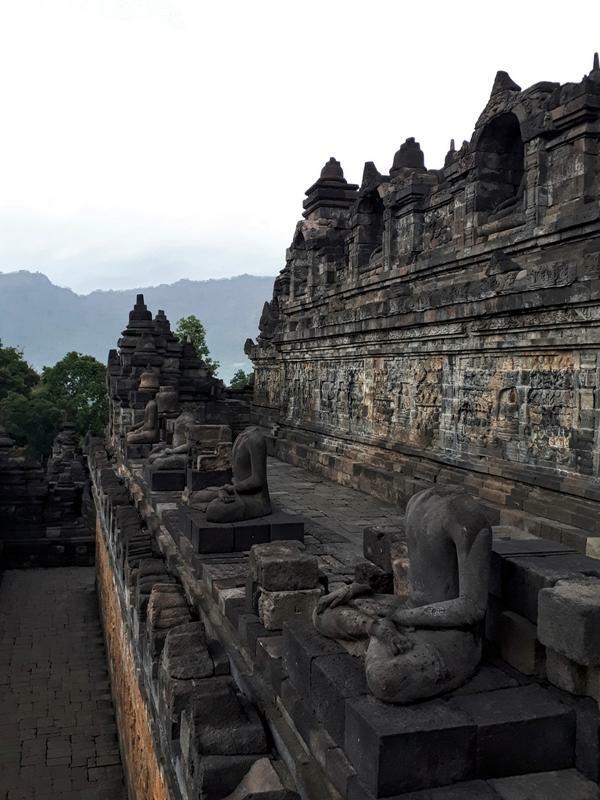 After sitting down for a while I started to walk around the temple to admire the many statues and reliefs. 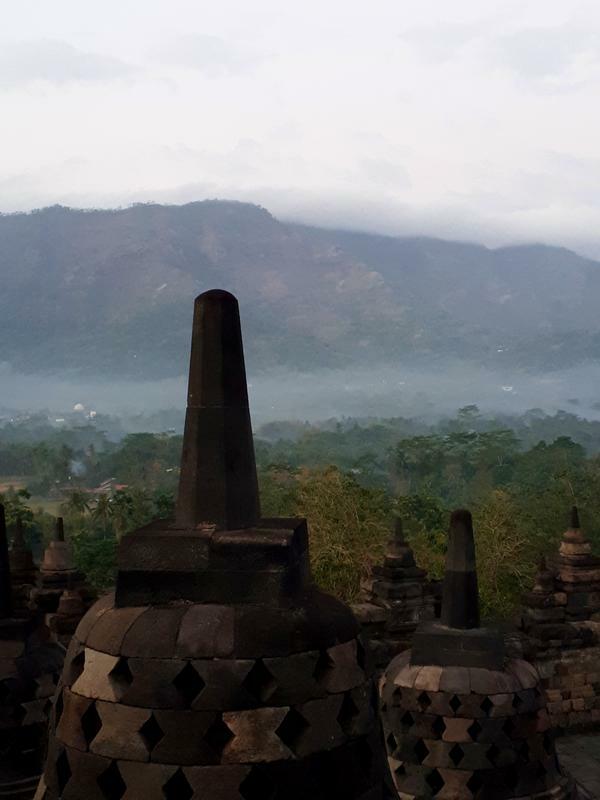 What a gorgeous and unique place Borobudur is. 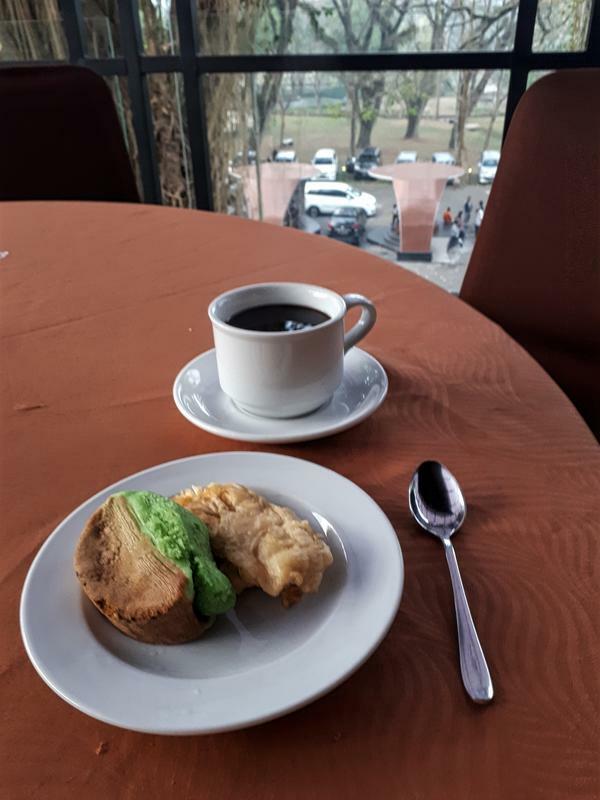 The entrance fee for the Borobudur sunset (slightly higher than the normal entrance fee) includes a small snack in a coffee at the restaurant above the ticket office – which is much appreciated after getting out of bed this early. After the snack I went back to the car park to find my driver. 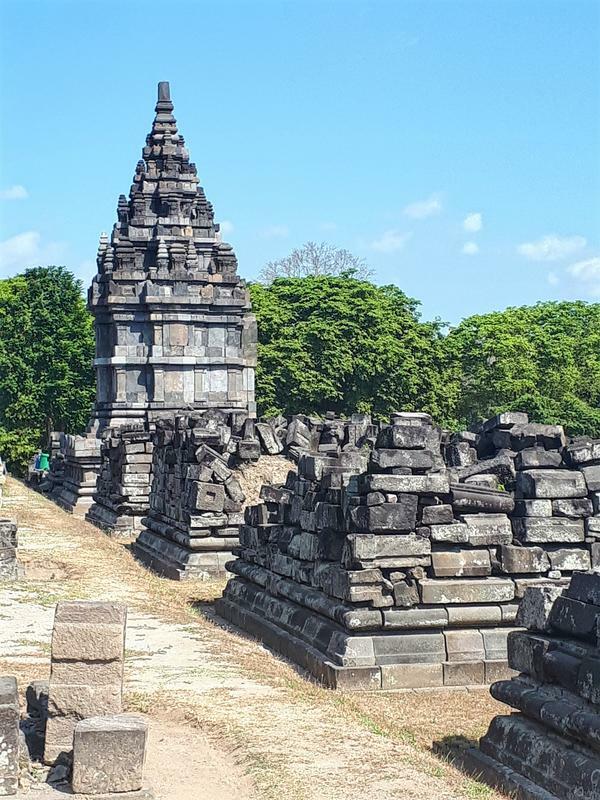 There was however a surprise in store as instead of driving straight to Prambanan, we also made another stop en route which I didn't knew was in the programme. 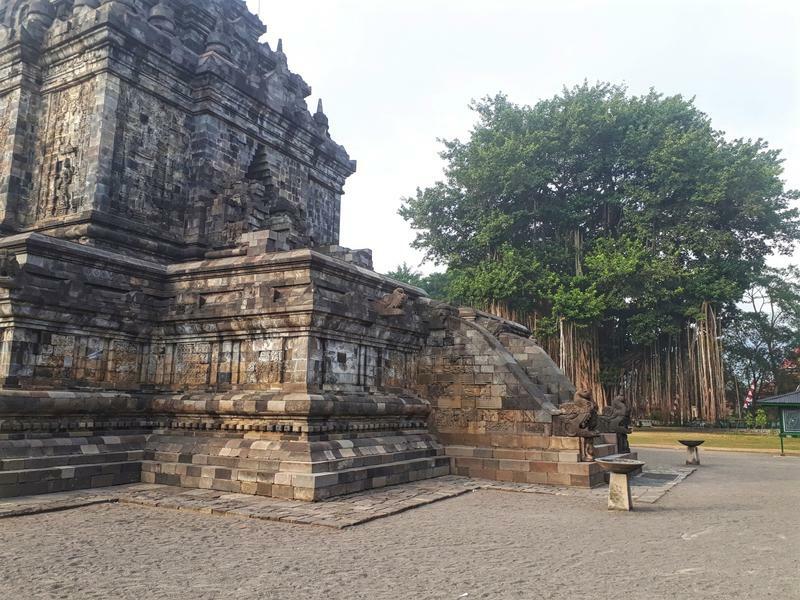 The 9th-century Mendut Buddhist temple is located in the town of the same name – and was completely deserted by the time we arrived there in the early morning. 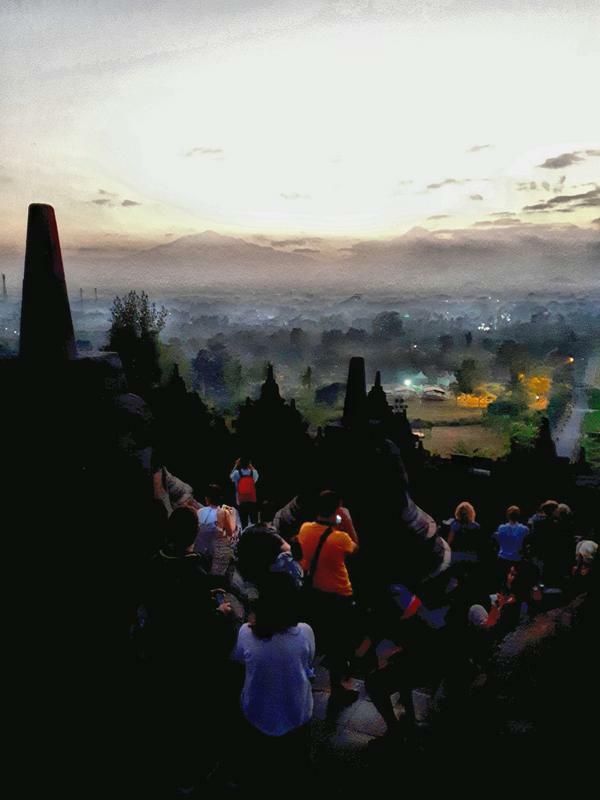 Mendut, Borobudur and another temple called Pawon are all three located in one straight line. 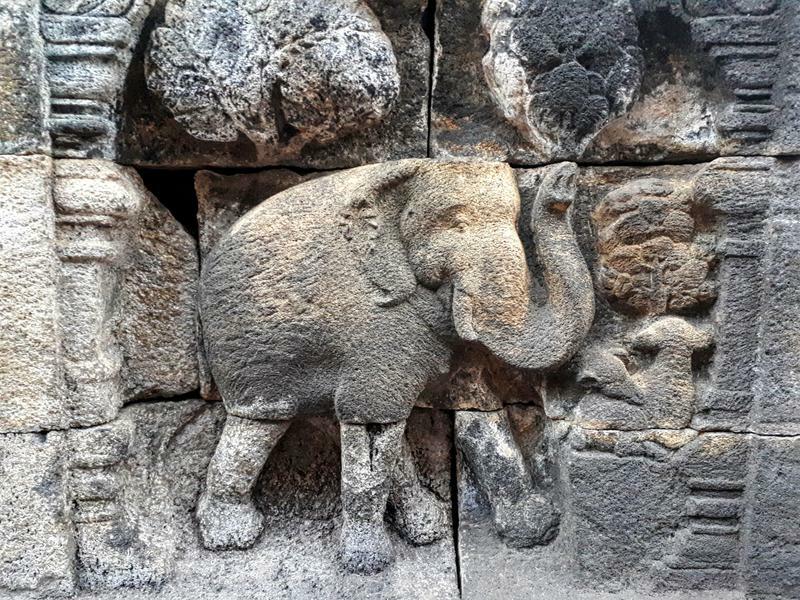 Eve though there is a mutual religious relationship between the three temples, archaeologists are however not sure what the exact ritual process was. 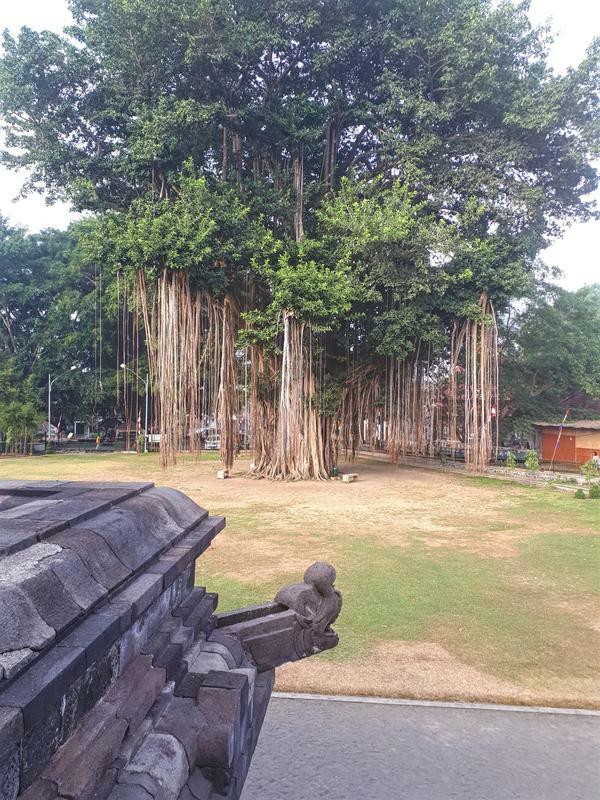 Mendut is small – but is lovely located next to a giant, old tree. 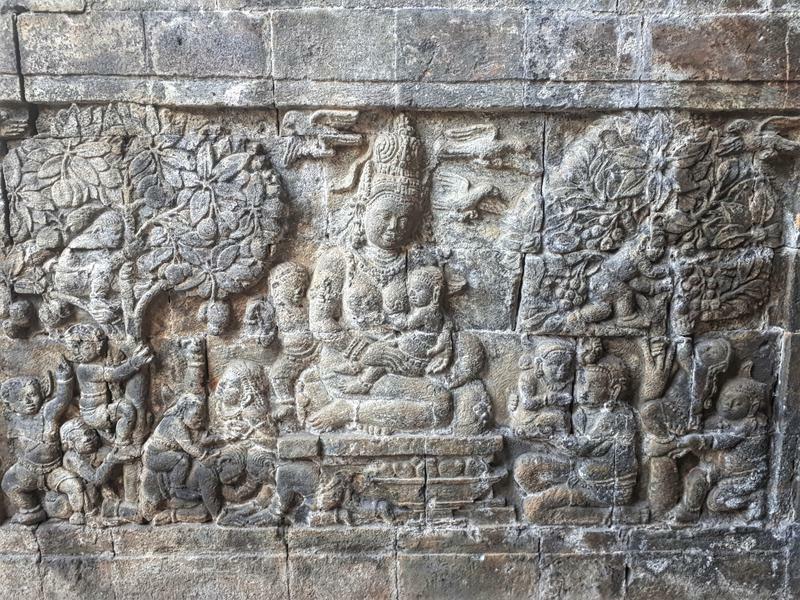 There are some cool reliefs and statues at Mendut as well. 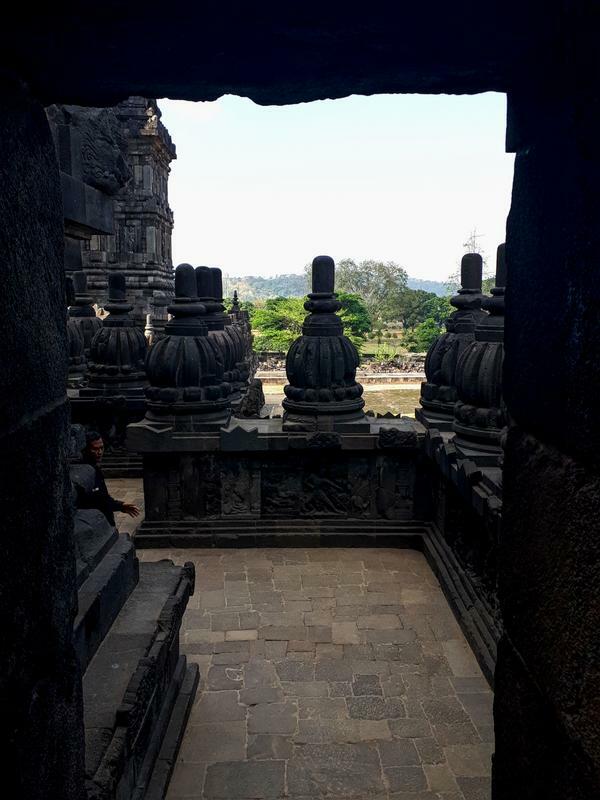 Next up: The temple complex at Prambanan. The Phoenix does indeed seem nice enough, however after reading your review, I’m happy we opted for the Marriott instead. 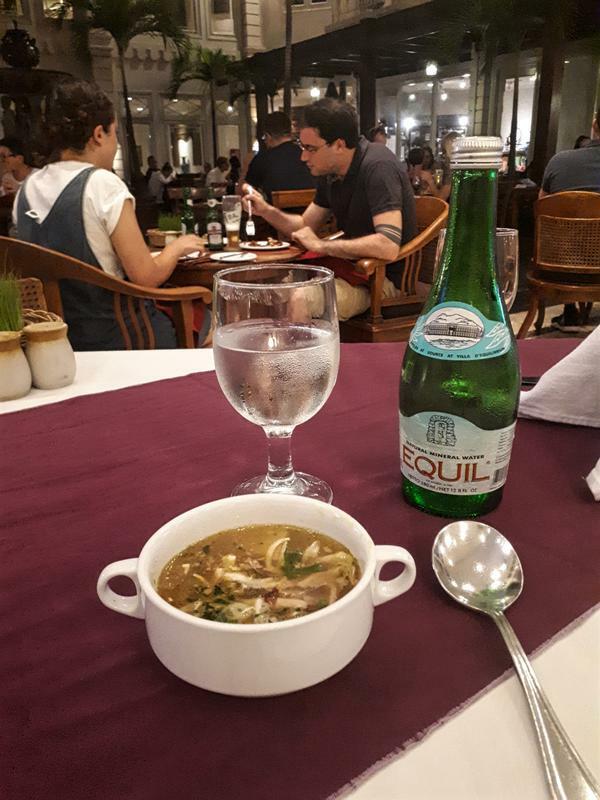 It doen’t have the colonial charm but exceeded expectations on the food front. 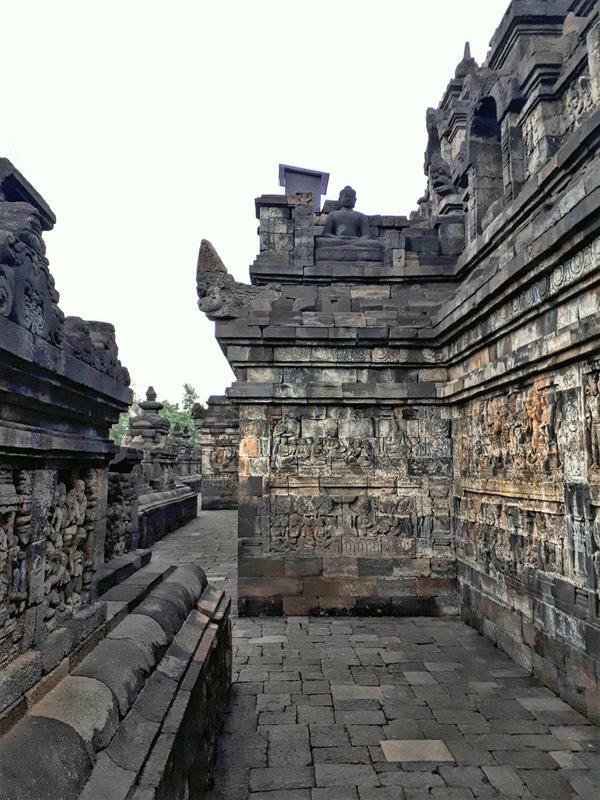 loved the region and the tempels around Yogjakarta! I very much enjoyed the region as well. 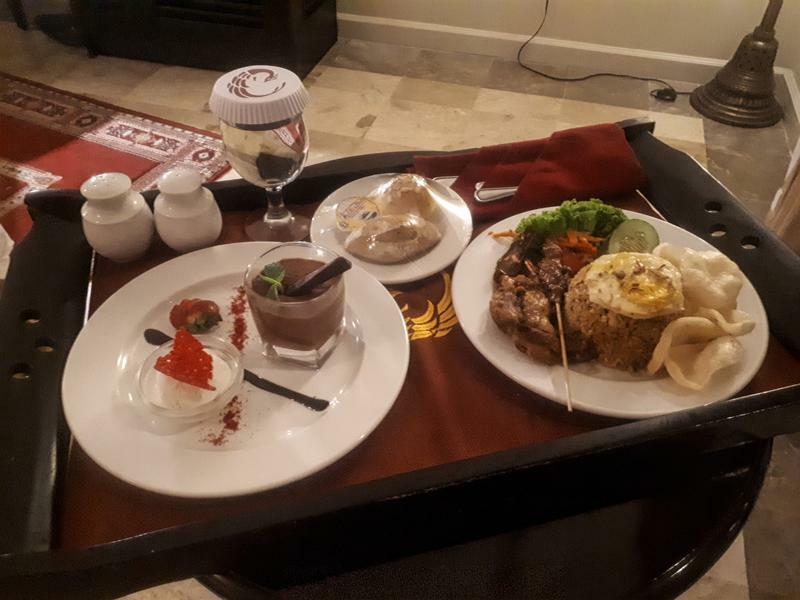 And yes, even though I didn't think the Phoenix was bad at all and I enjoyed my time there, I might also check other hotel offers if I'd be again in the region. It indeed is a lovely place to visit! 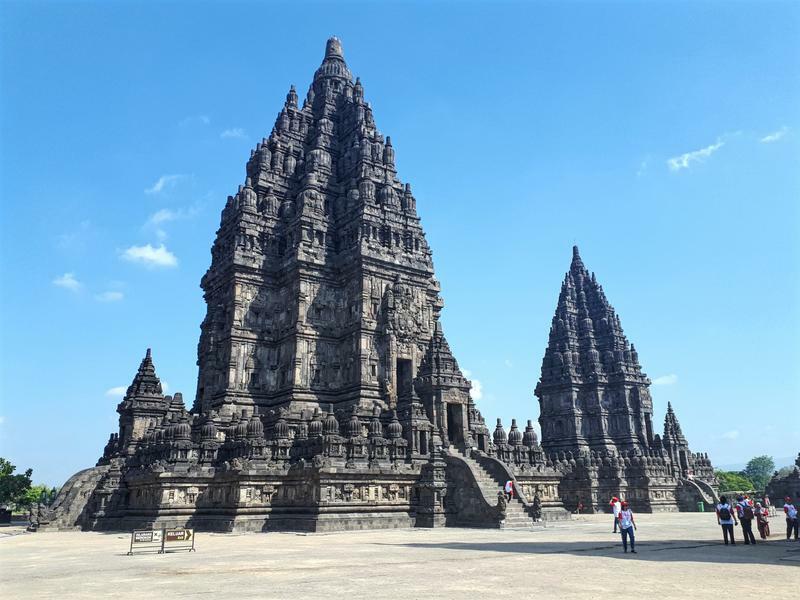 Prambanan is another 9th century temple complex located just a short drive out of Yogyakarta. 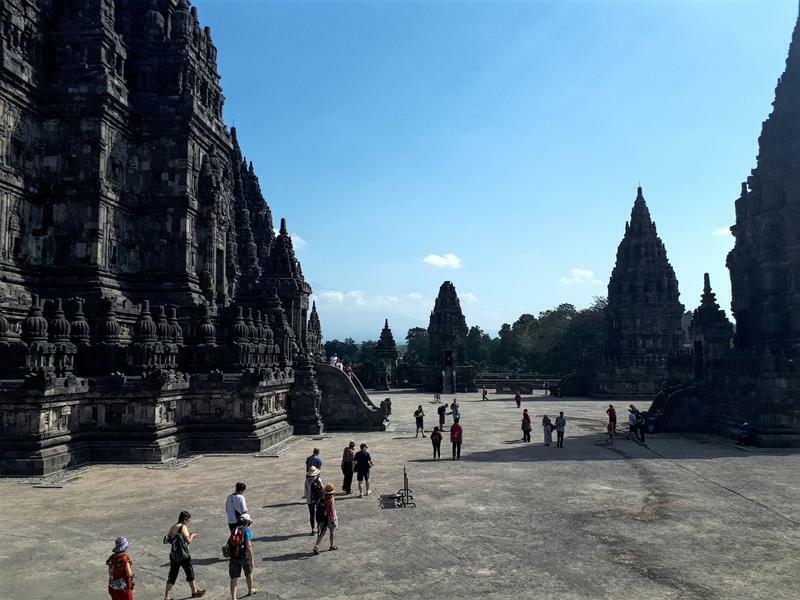 Unlike the Buddhist complex of Borobudur, Prambanan is a Hindu temple complex. 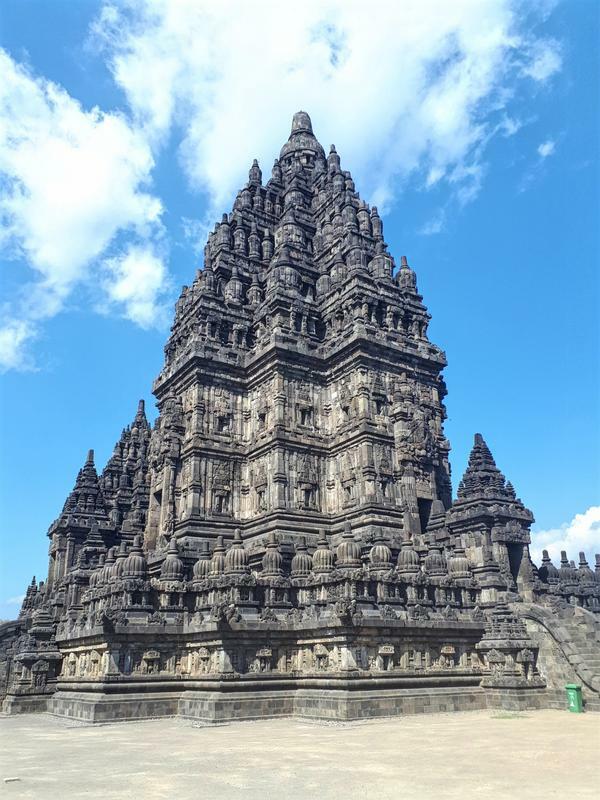 The UNESCO World Heritage Site is the largest Hindu temple in Indonesia and one of the biggest in all of south-eastern Asia. 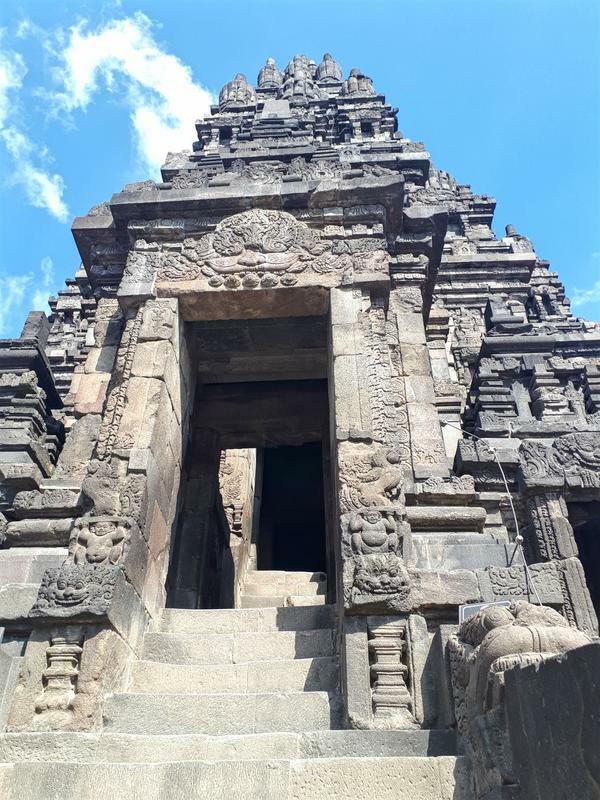 It was most likely built by a local Hindu dynasty as a reply to the construction of Borobudur by a rival Buddhist dynasty. 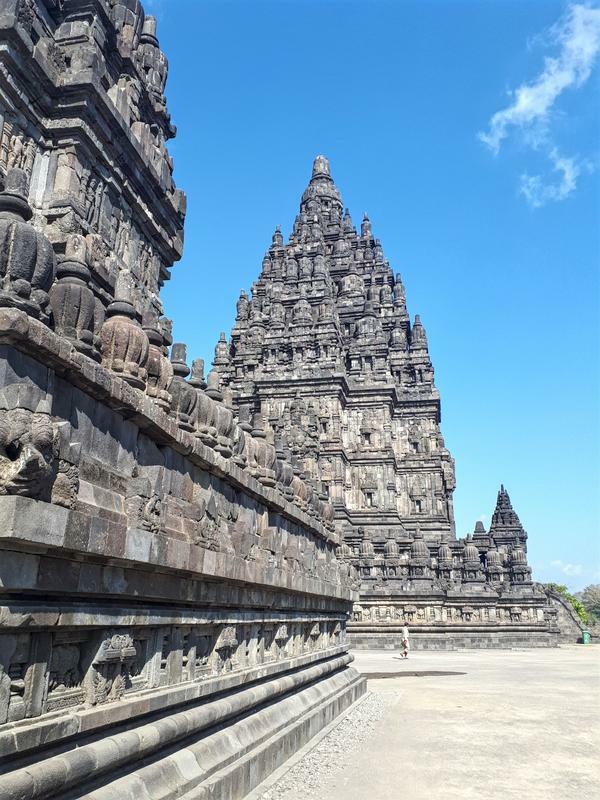 And sure enough, Prambanan is equally beautiful as Borobudur with magnificently carved reliefs on the temples. 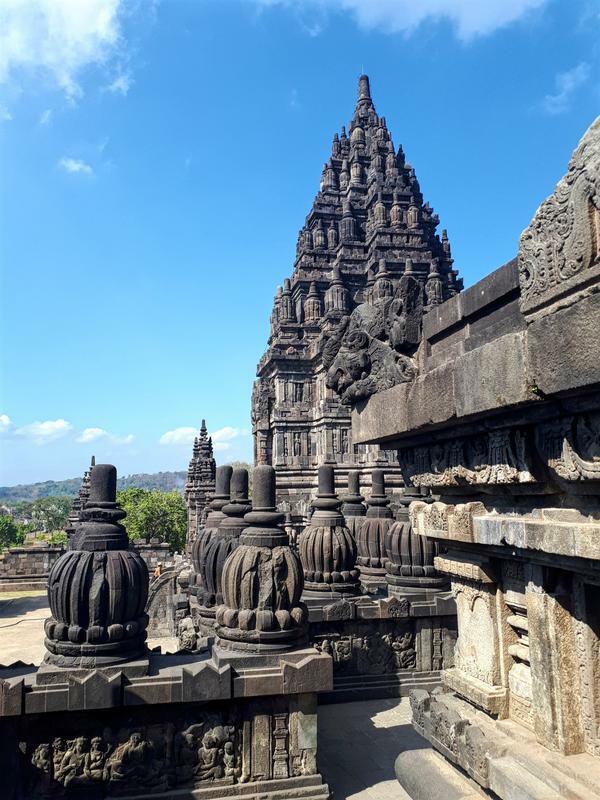 Perhaps even more so than Borobudur, Prambanan is an awe-inspiring sight when you approach with the large temples looming in the distance. 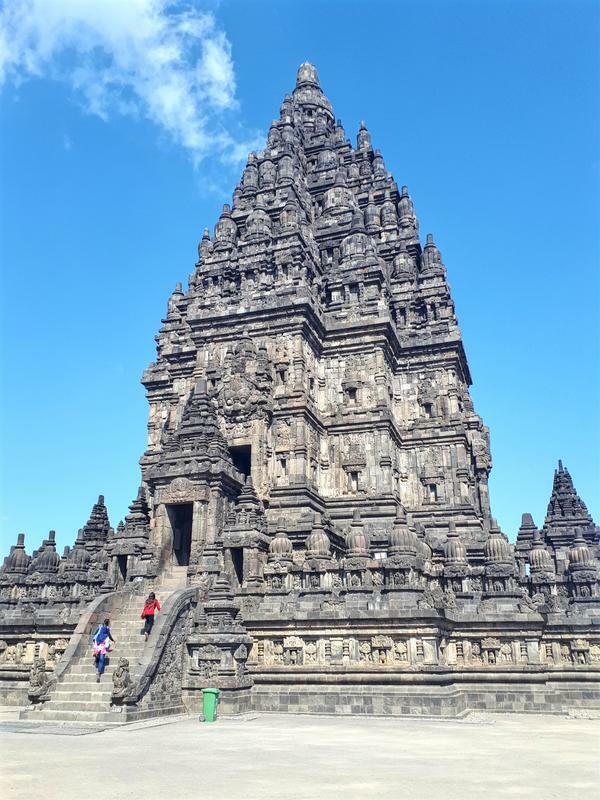 Each temple is dedicated to a different Hindu god – and features a statue of the respective god deity inside. You reach the inside by climbing a number of stairs up. 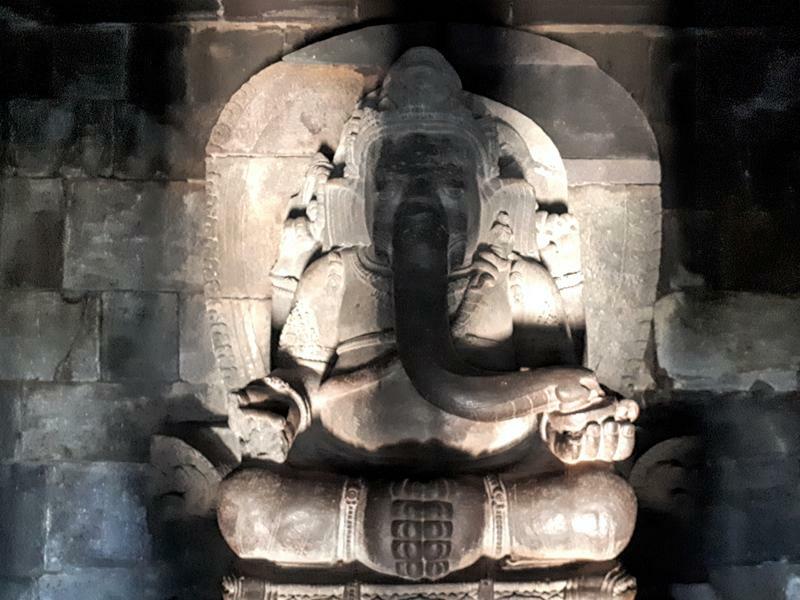 In the case of this temple, it was the Hindu god of Ganesh – easily recognised by its elephant head - to whom the temple is dedicated. 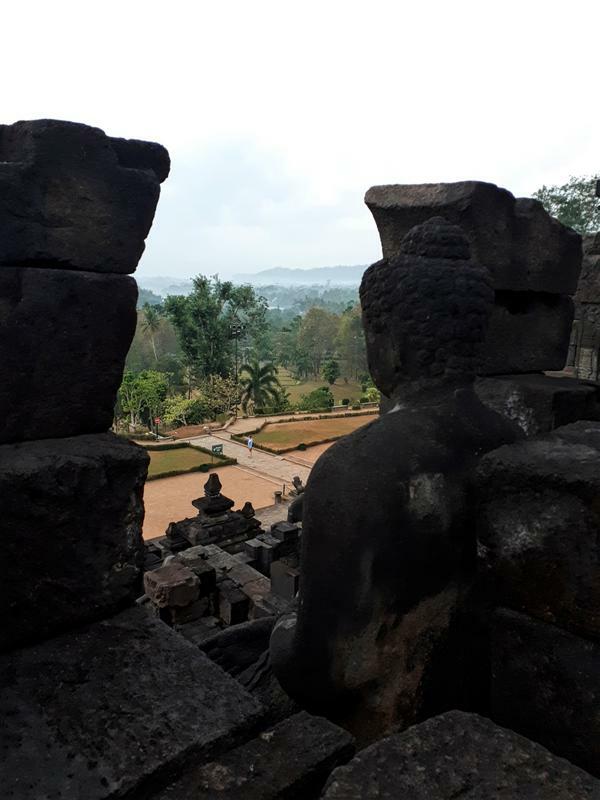 The lack of crowds and the amazing music which was constantly playing (some very mellow and mesmerising tune in which some bells/triangles were ringing) made for some amazing moments exploring the site. 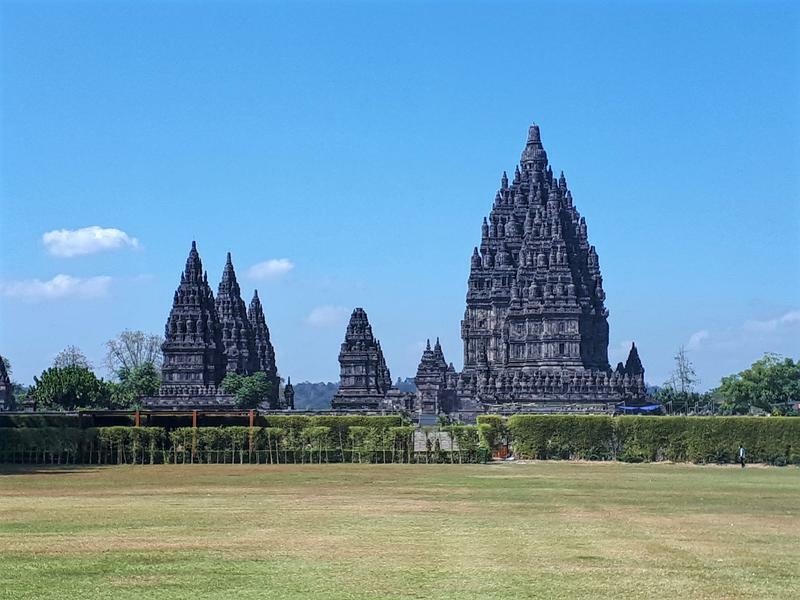 Simply put, Prambanan for sure would rank very high among the most beautiful historical complexes I've ever seen. What a fantastic day trip this turned out to be. 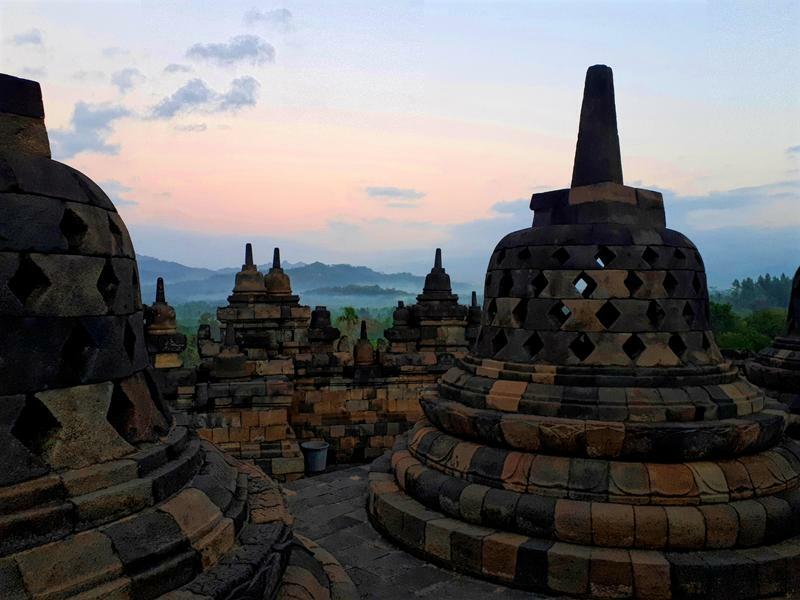 In short: When in Indonesia – it is a must to hop to Yogyakarta, if only to see Borobudur and Prambanan. There are plenty more temples in the direct area, some volcanos and even OK beaches what I've heard from some locals. I would only wish I had more time in the area and did not have to work remotely for most of the duration of the trip. Next up:Checking out the comfort of the Indonesian Railways by travelling from Yogyakarta to Surabaya. Thanks very much for reading along! 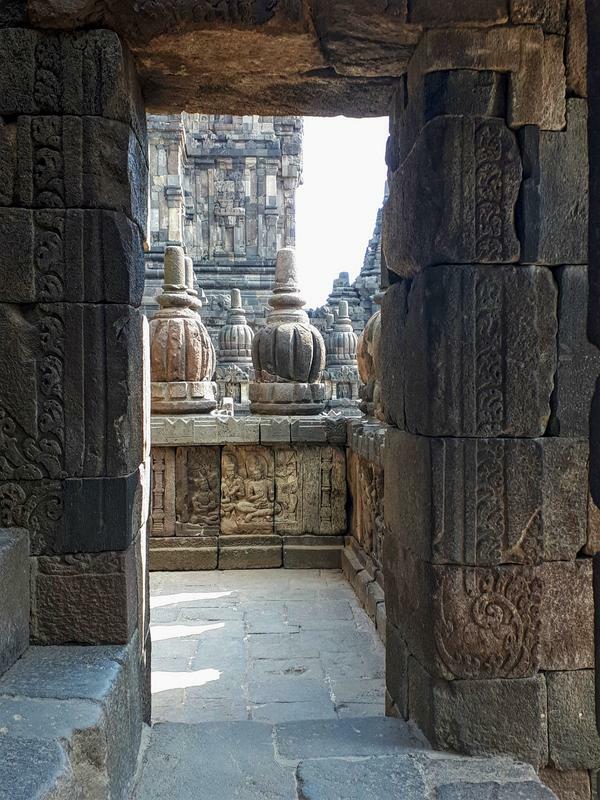 Although credit for the pictures mostly goes to the 9th Century architects which created such marvels!